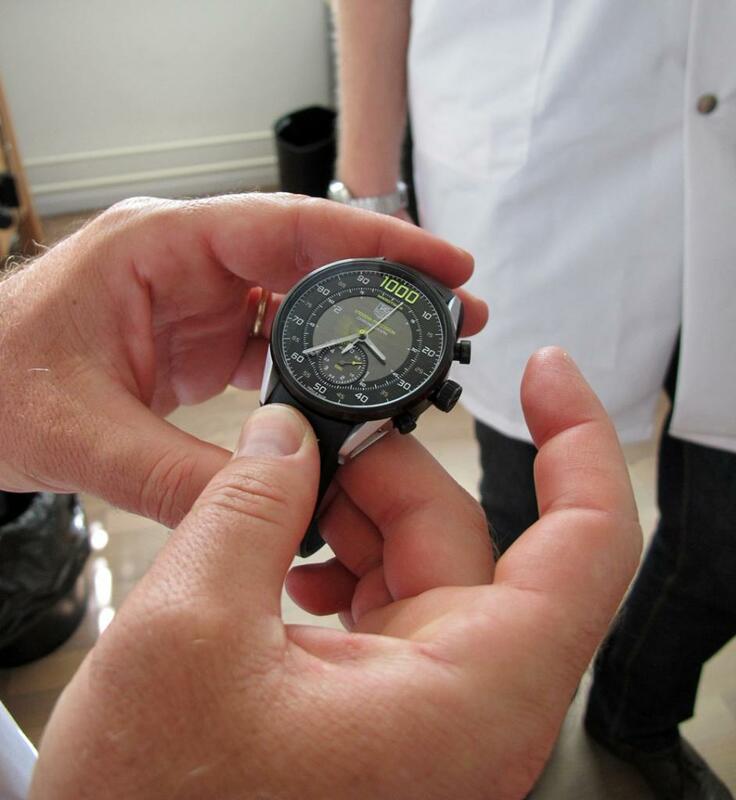 The 2013 version of the Vintage Heuer Collectors Summit took place on September 1 and September 2, 2013, in La Chaux-de-Fonds, Switzerland, the home of TAG Heuer. In this posting, we present two reports from the Summit, the first by event organizers Paul Gavin, Ron Henselmans and Abel Court, and the second by our regular contributor, Mark Moss. 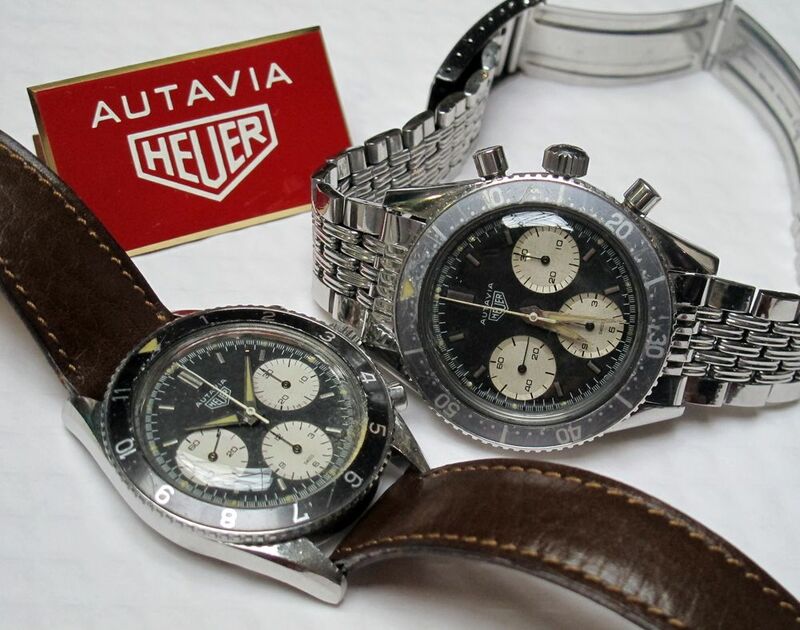 Both these reports were first published as postings on the Chronocentric Vintage Heuer Discussion Forum, the report from Paul, Ron and Abel being published on September 23, 2013 and the report from Mark being published on October 6, 2013. Members of the community thank Paul, Ron and Abel for organizing this amazing event and for providing this report. 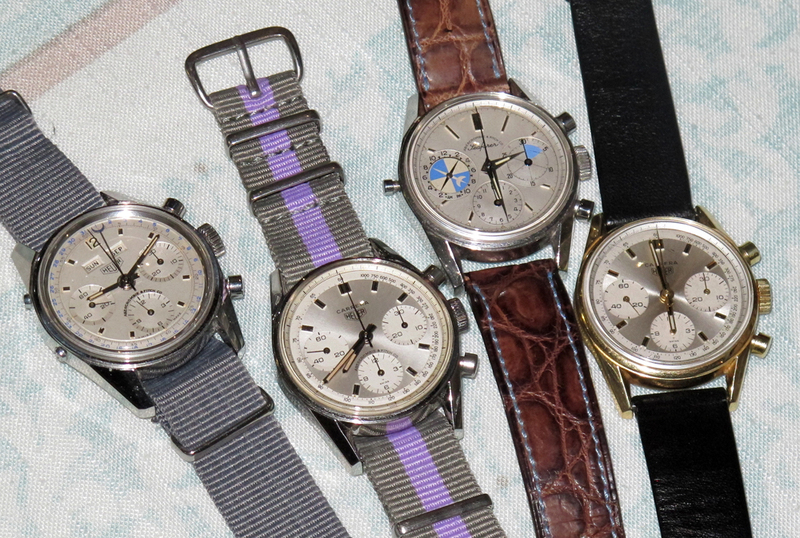 The passion that unites us is the vintage Heuer brand and the watches that bare the name. There is nothing quite like shaking the hand of a fellow collector for the first time. Someone that you have come to know through a shared interest, communicated with for possibly years on the subject and shared a laugh or two, all at a distance. 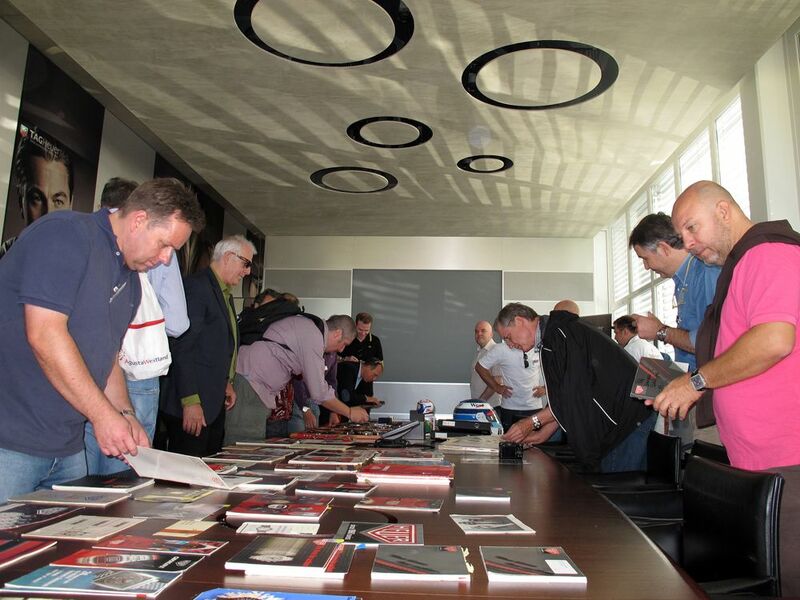 The Heuer Summit of 2013 was such an occasion where a number of like-minded individuals gathered for two days to cement these bonds, make new ones and renew old ones. 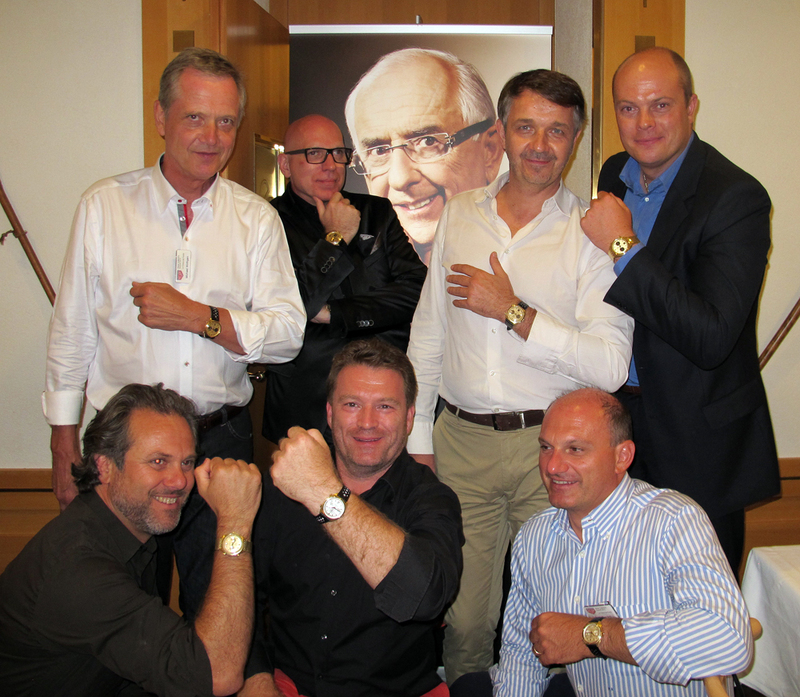 The location for the Vintage Heuer Collectors Summit of 2013 was La Chaux de Fonds in Switzerland, the home of TAG Heuer and an obvious choice for such an occasion. In fact, this was the third such event at this location, first one was in 2008. 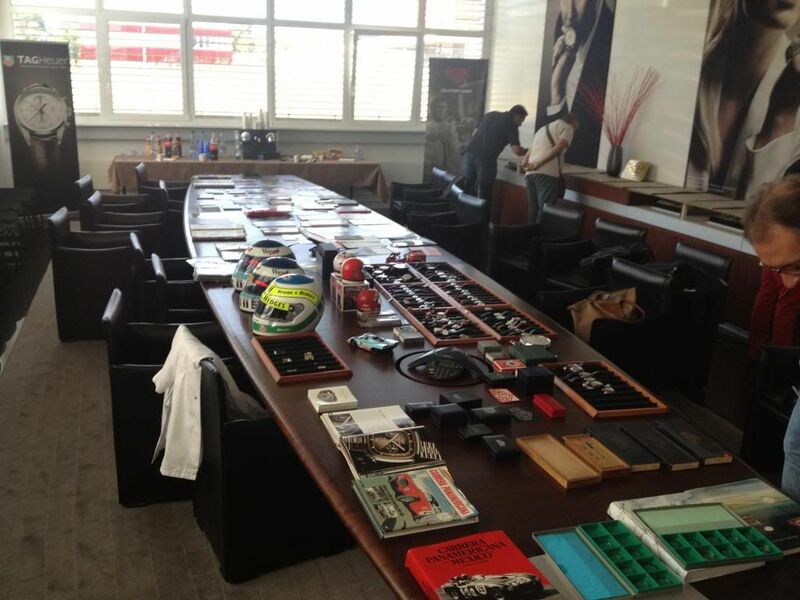 The event was facilitated by and with the full support of the Heritage department at TAG Heuer. 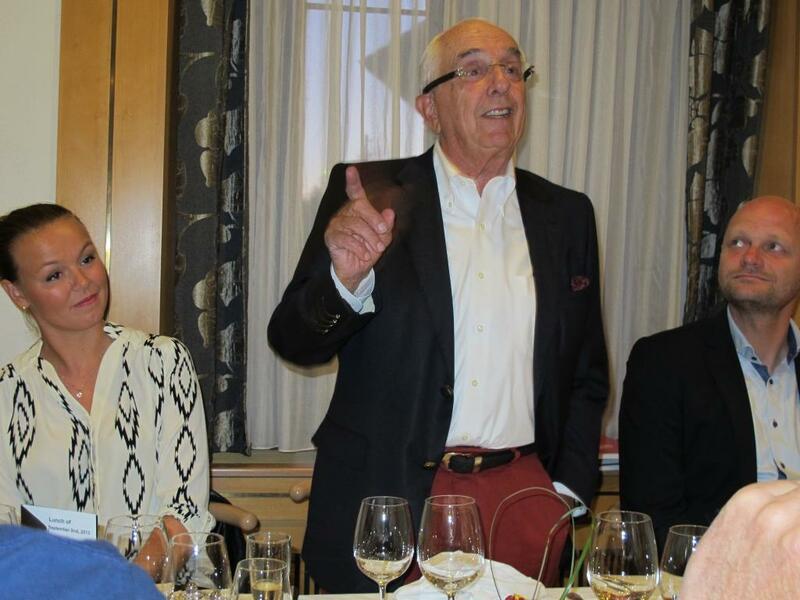 Fabienne and Marie put together a packed two-day program, as well as a celebratory dinner with the best possible guest of honour, Jack Heuer himself. It was made clear from the start that Jack’s attendance was subject to a number of factors and it was 50/50 that he would be there. 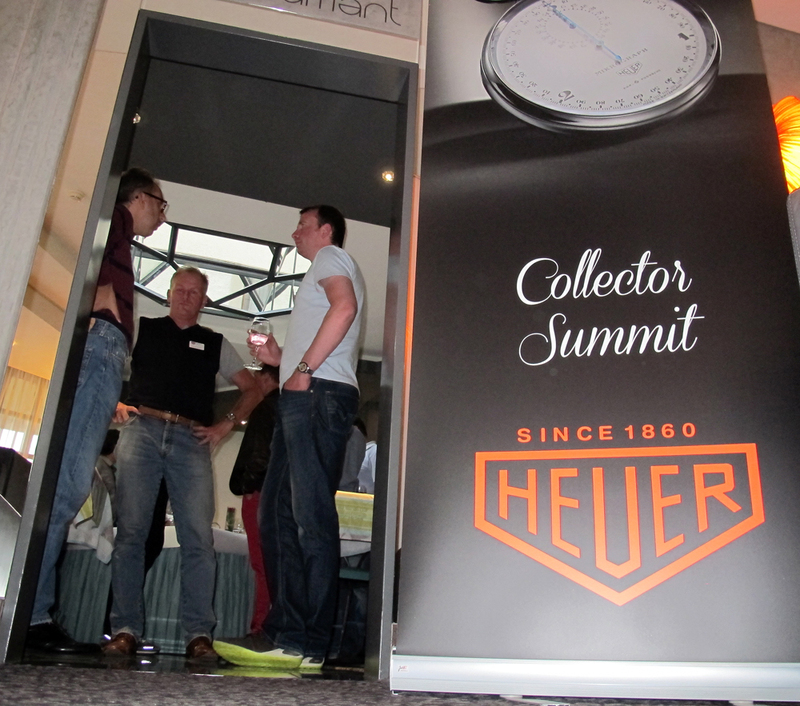 Just two weeks before we were due to arrive, it was confirmed that he would be attending and the makings of the best Heuer collectors summit were now complete. 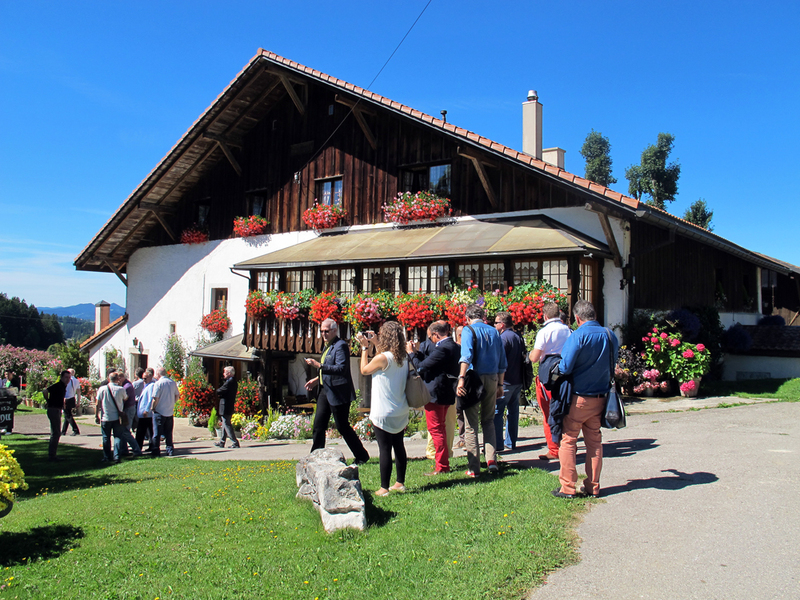 It all started on Sunday, September 1, and the attendees began arriving at the lovely Grand Hotel Les Endroits from around midday. By the evening most had made it traveling from all across Europe and the United States. 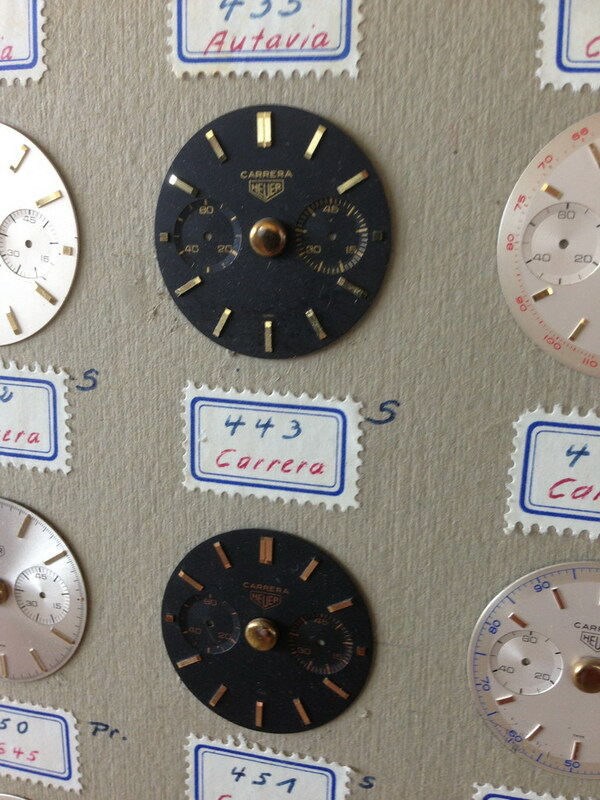 The room was alive with Heuer aficianados, making contact in many cases for the first time. 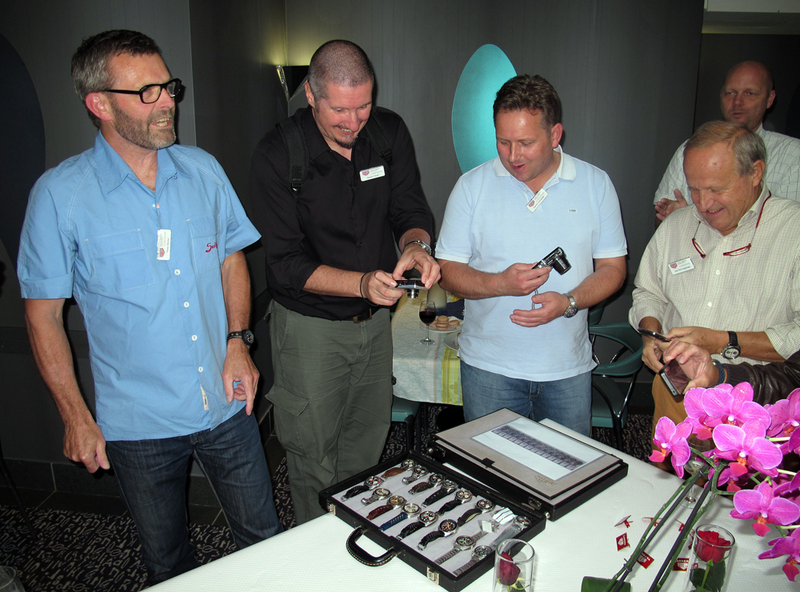 It was a grand show and tell, with fine vintage Heuer examples adorning the wrists and spilling out of cases for everyone to admire and enjoy. It was a long night for most and a fine one at that. It is worth mentioning at this point that due to the program of events, the number of participants was limited to 30. It was with a heavy heart that we could not open this up to everyone who wanted to participate. We had no doubt that if we made a public invitation it would have been oversubscribed, so we had some tough decisions to make as to who would get the invite. It is inevitable that there are some disappointed collectors who could not be with us and we hope that they will be at the next one. 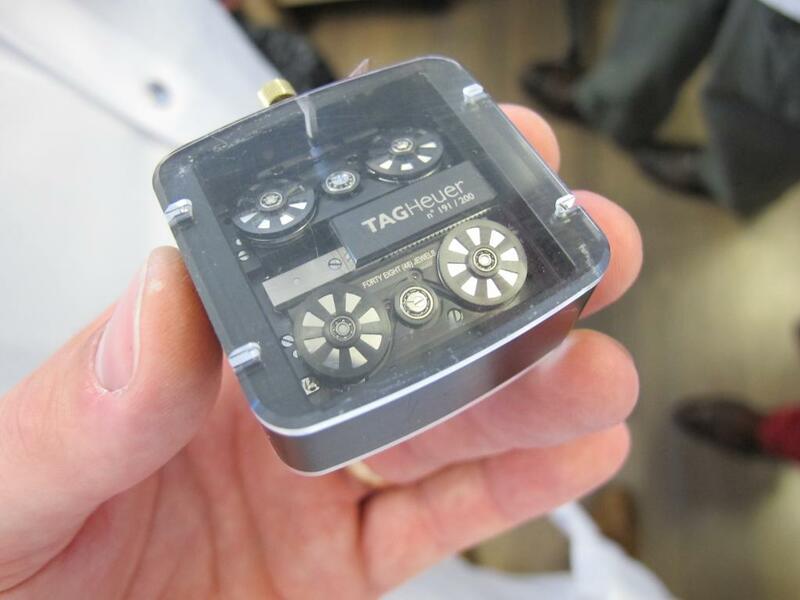 Monday’s events included a tour of the impressive TAG Heuer facility. We were divided into two manageable-size groups, one went on a tour of the manufacturing facility whilst the other had a watchmaking course, tour of the Museum — with none other than Jack Heuer himself as the Museum tour guide — and access to a vast array of information, watches and parts from the archives, all laid out in the boardroom. 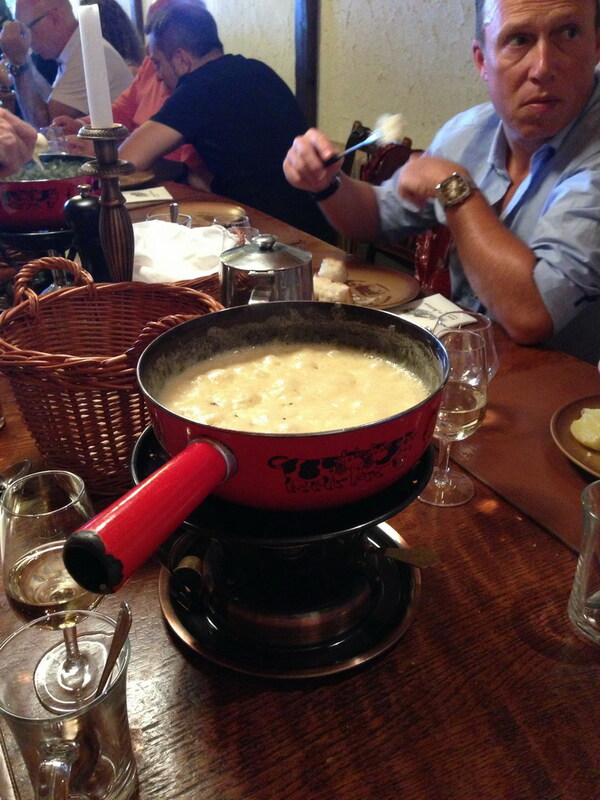 Lunch was held at a traditional Swiss restaurant serving a cheese fondu. In the afternoon, the group activities were reversed. 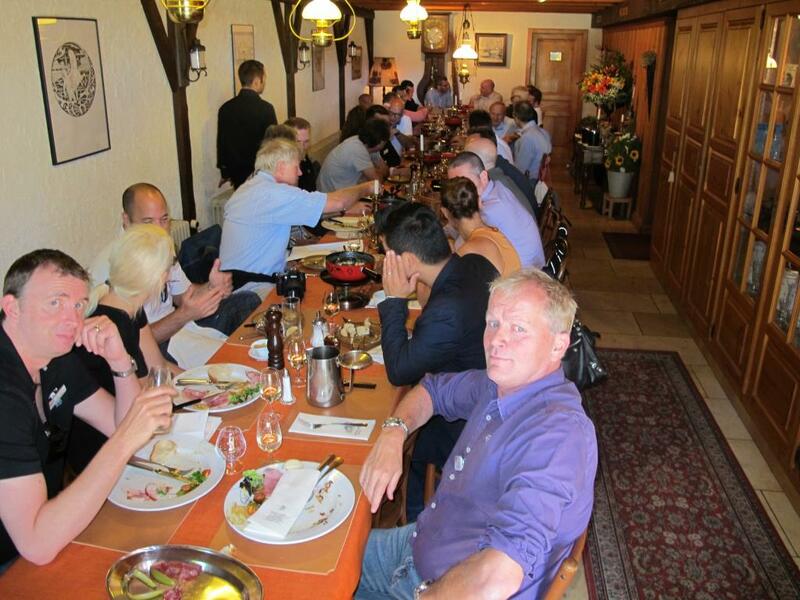 Monday evening was the official dinner which was attended by all the delegates, as well as Marie and Jack. The food was good, the drink flowed and the conversation was all about watches. We had the privilege to listen to Jack make a short but poignant speech. His official retirement is almost upon us, so his presence that evening was emotional for all concerned. 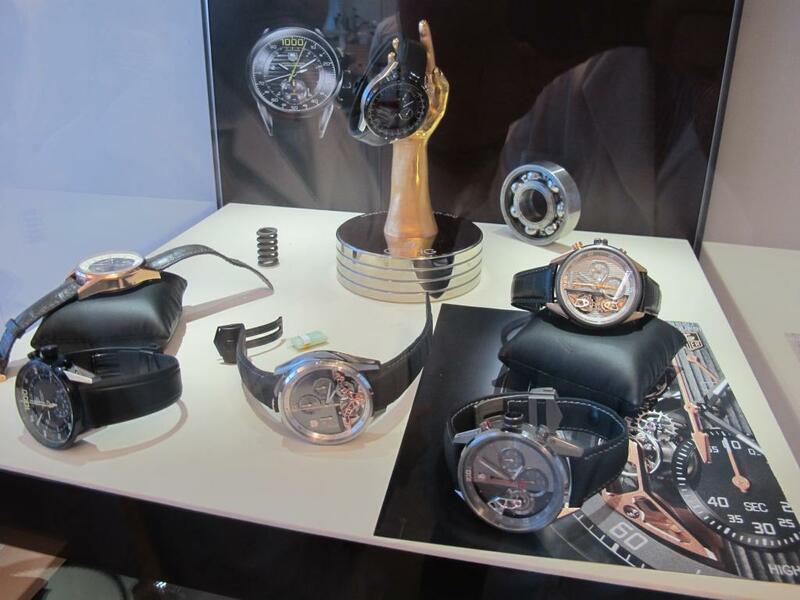 Paul made a welcome speech and pointed out that the vast majority of watches in the attendees’ collections were from the period during which Jack was at the helm of the company. 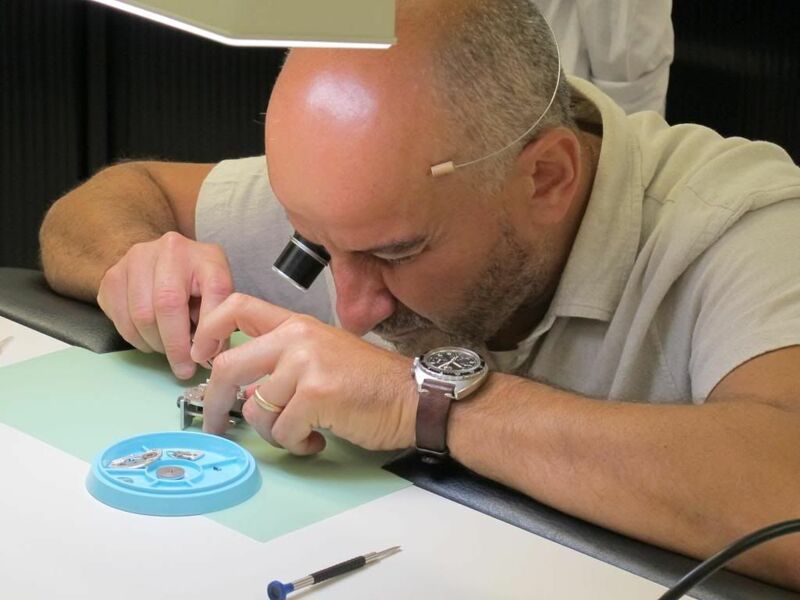 That in itself was testament to the role he played in facilitating the creation of many classic and collectable watches and is ultimately his legacy to us. We honoured Jack for this and in return he honoured all of us with his presence and his generosity. 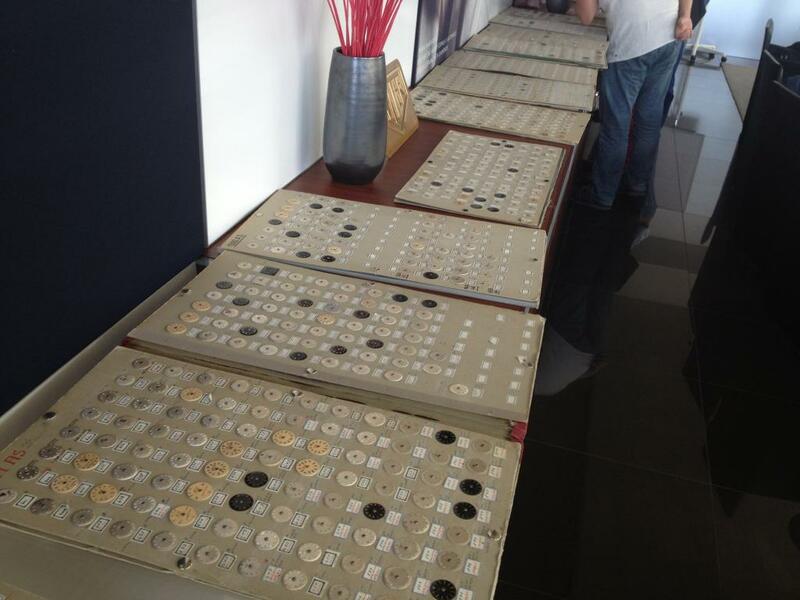 For those who stayed around for day two, we were treated to a factory visit at Artecad, a dial manufacturer based in a nearby town. There are no pictures of this part of the event because cameras were not allowed. 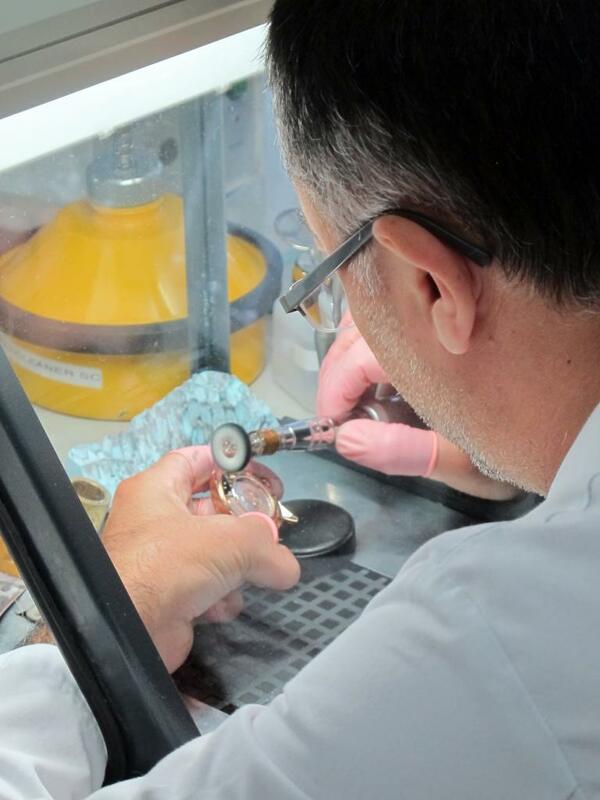 It was fascinating to see the technology employed and the resources and expertise that goes into the making a watch dial. This was followed by a lovely lunch after which it was time to bid our hosts and our friends goodbye as we departed for our homes across the world. 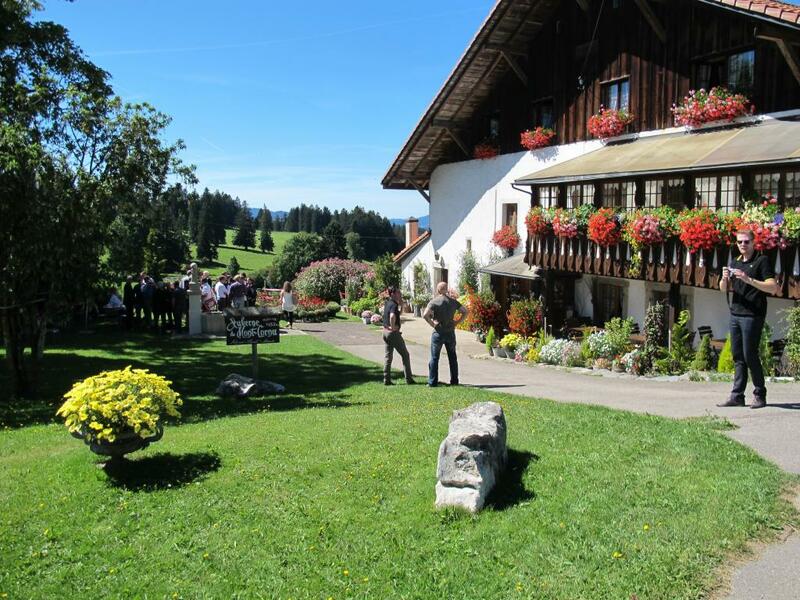 We would like to thank our hosts TAG Heuer — and especially Fabienne and Marie — for making us feel so welcome and for taking care of every detail which made for such a wonderful time. Thanks also to all the attendees most of whom traveled a long way to be with us and make such great memories. 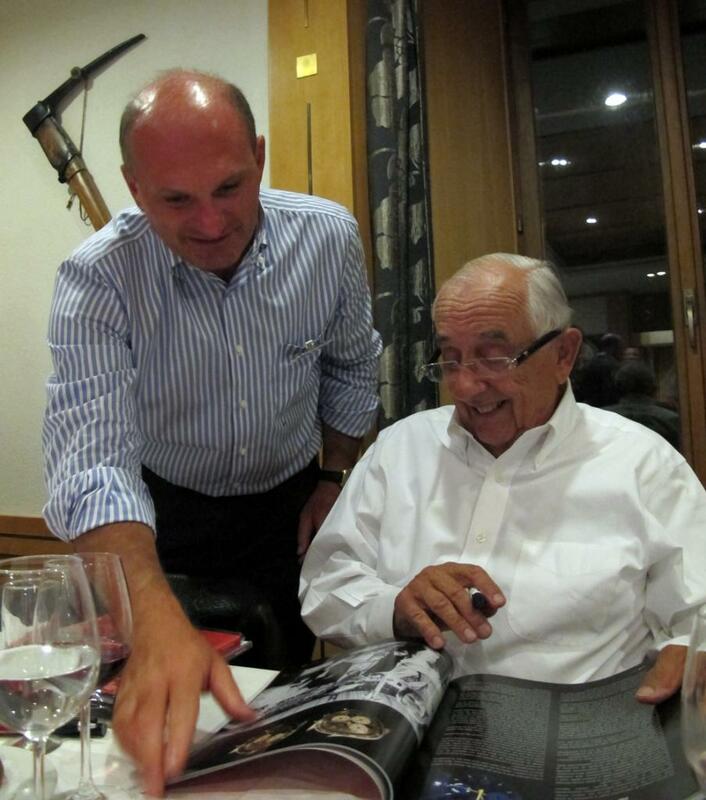 Finally, all our thanks to Jack Heuer, a true gentleman and legend in our world. Here are a small group of pictures and to make this posting even more interesting. It would be great if all participants could post some more pictures that were taken during this summit. Almost everybody was walking around with a camera, so there surely will be some more very nice photos to share with all of us. Paul Gavin, Ron Henselmans and Abel Court. 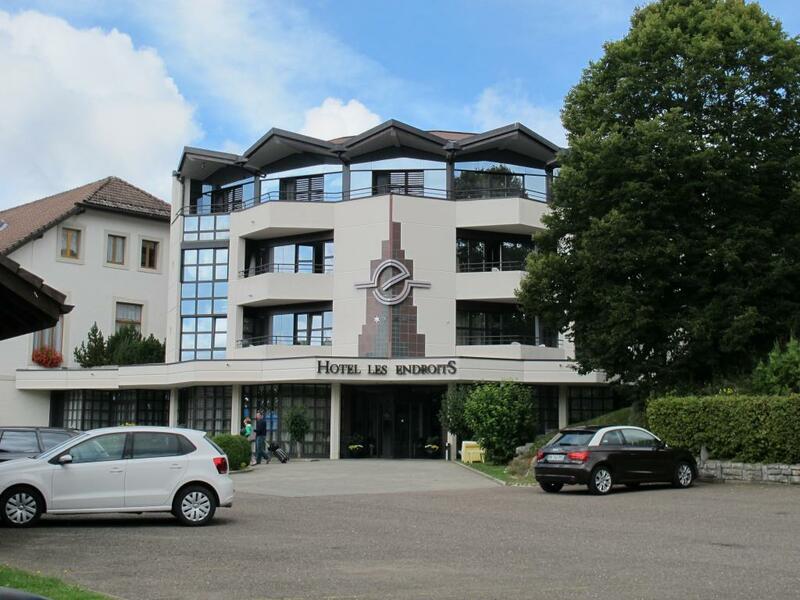 Our hotel at La-Chaux-de-Fonds, Switzerland. 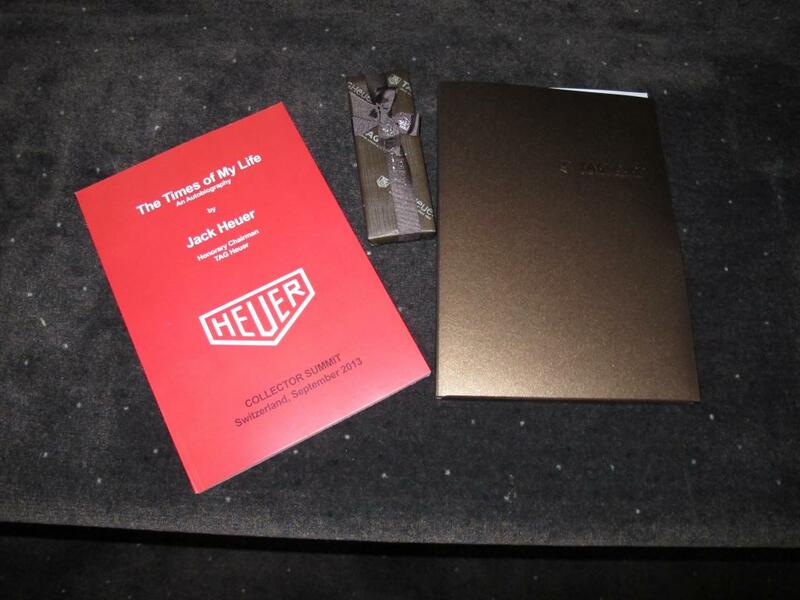 All participants received a wonderfull gift, the Autobiography of Jack W.Heuer, an absolute première and we all had to promise to keep it all private untill officially released at the end of this year or early next year. Fabrizio Rebella, Ron Henslemans and Richard Crosthwaite at the “cocktail”. 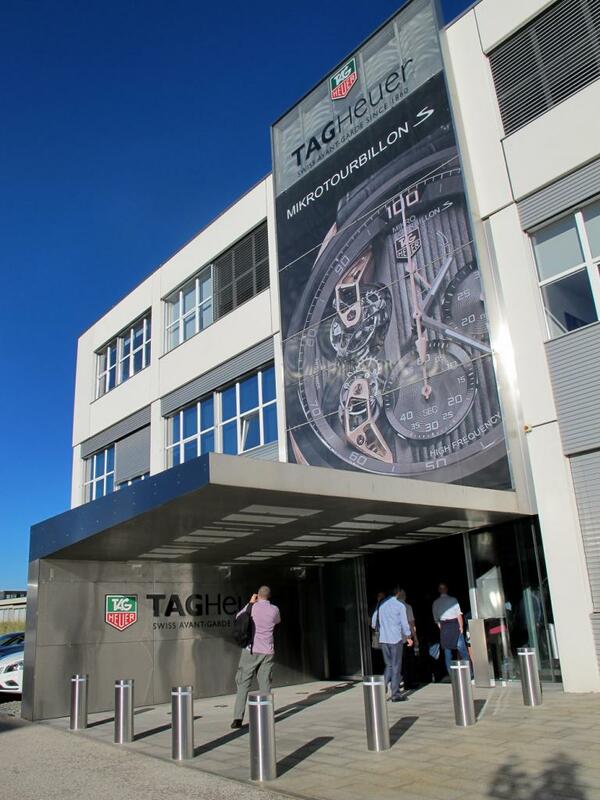 The main entrance of TAG Heuer Headquarters in La-Chaux-de-Fonds, Switzerland. 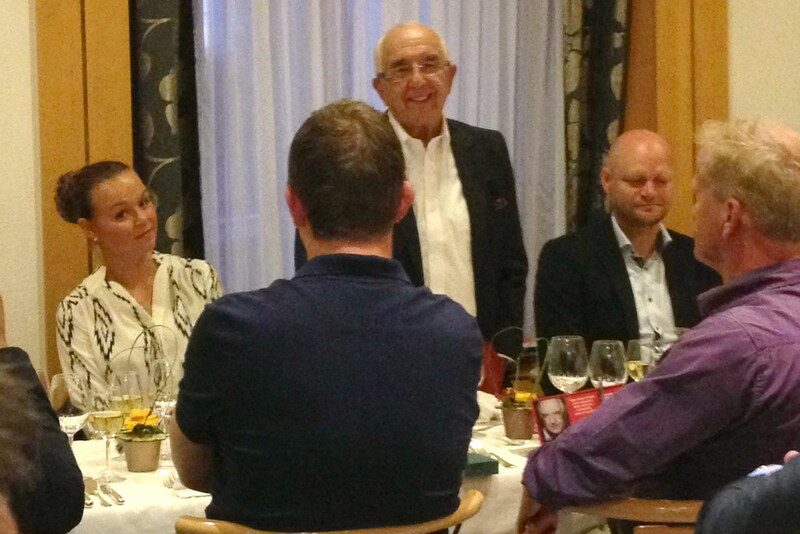 Jack W.Heuer at the Official Dinner at monday evening. 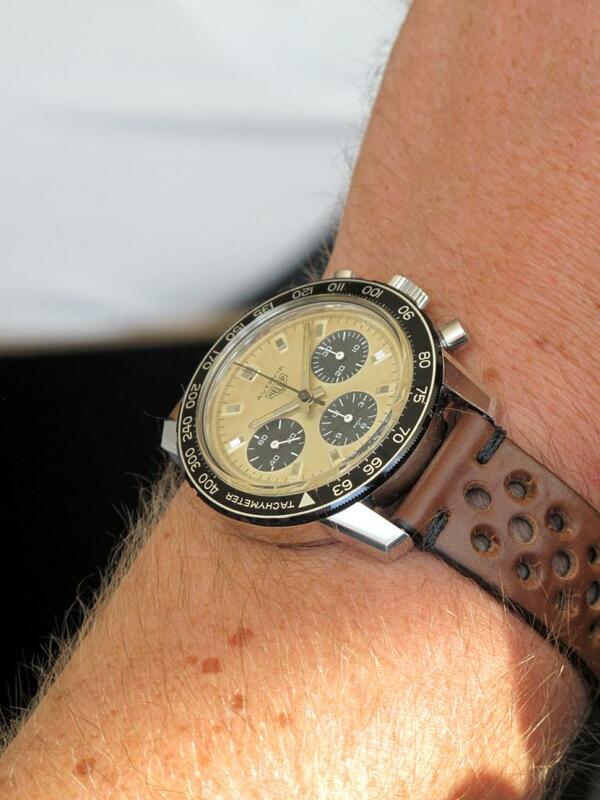 Eric Wind his Heuer Autavia “White Boy”. Paul Gavin while presenting his perfect speech. 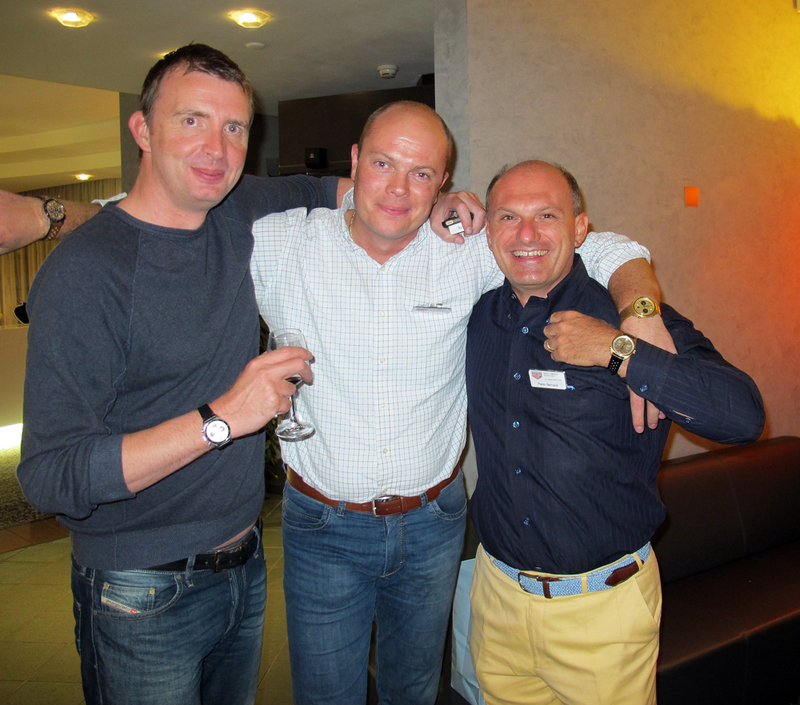 Richard Crosthwaite, Abel Court and Paolo Bernardi. 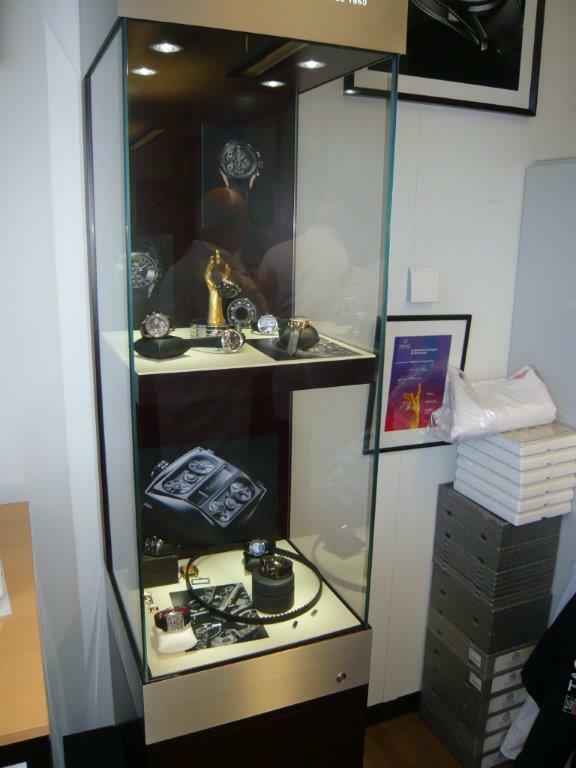 Display with some very expensive and exclusive TAG Heuer Timepieces, Haute Horlogerie. 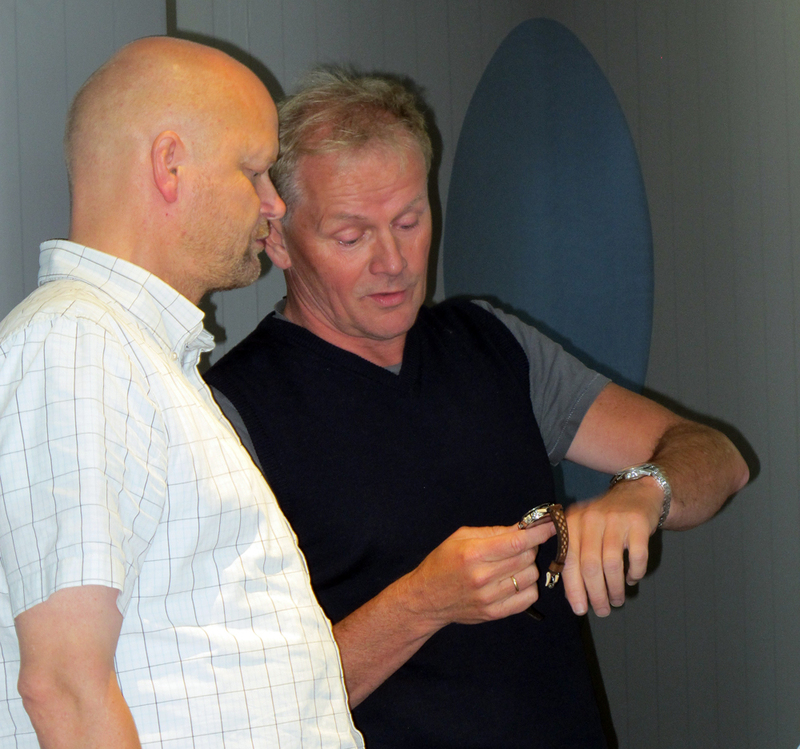 Olaf Langer (at left side) sees that it’s all good…Lanny Epperson on the right (clearly has doubts). Final touch before putting on the bracelet/strap. 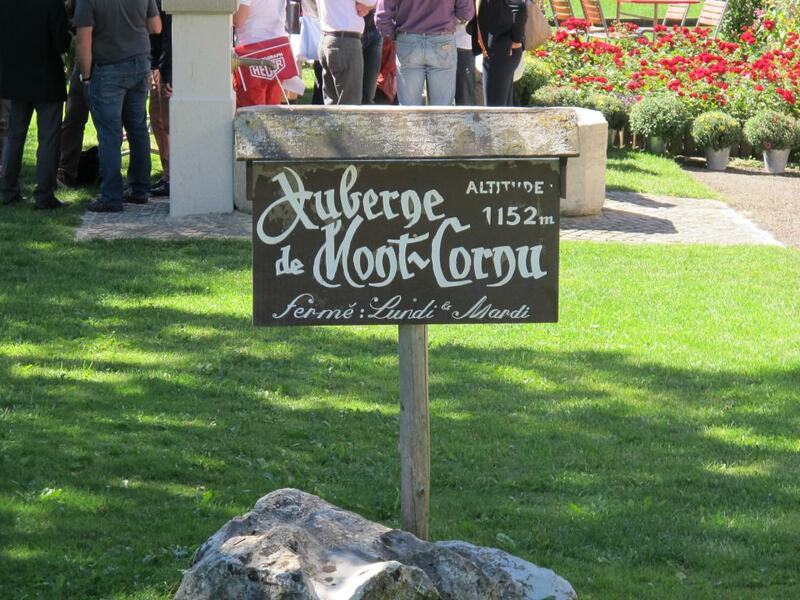 Our location for the lunch on monday – Mont Cornu. 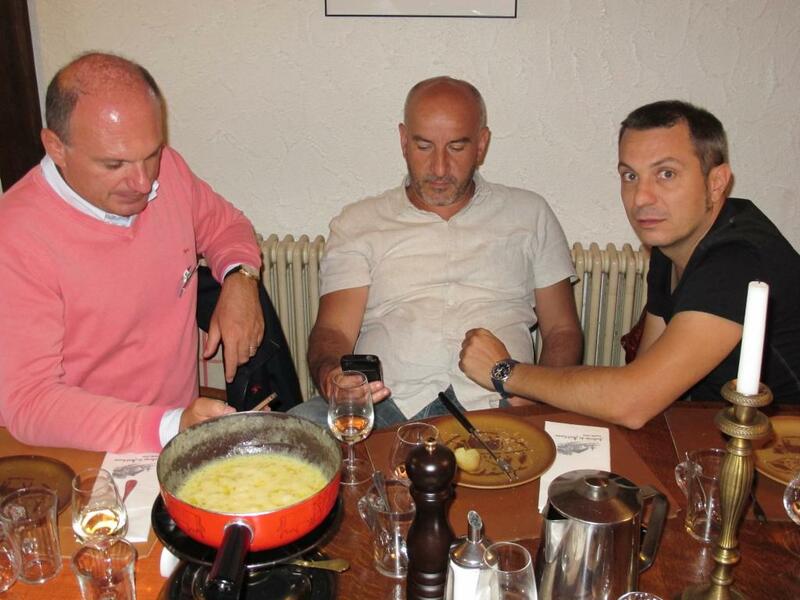 Three Belgians; Jean-Pierre Magalhaes, Abel Court and Gianni Vangaever. 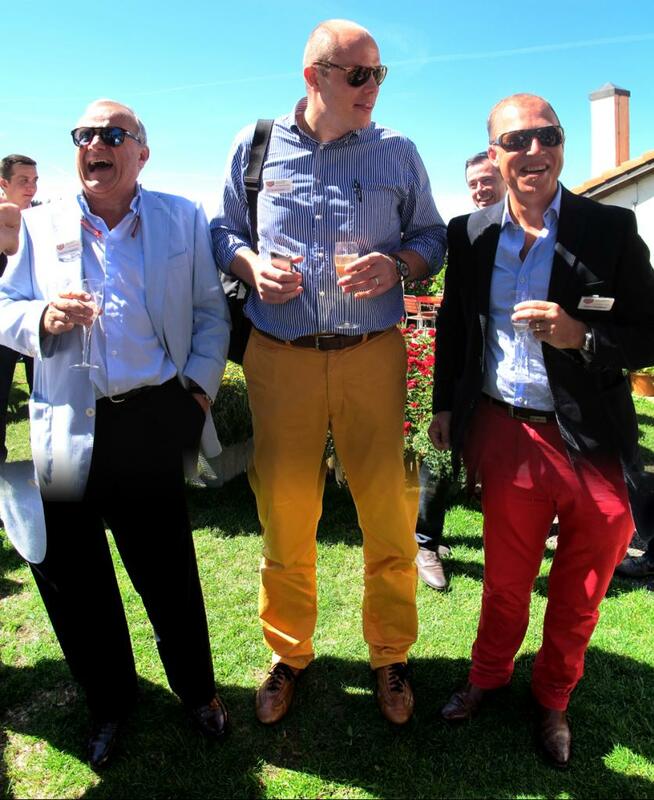 Please note the colours of the trousers…colours of the Belgian Flag! They also asked us to form the German Flag but we proudly refused! Better don’t mess with these guys; Paolo Bernardi, Francesco Bruni and Pierluigi Mancini. Another rare dial, for Heuer Autavia 3rd execution screwback ref.2446 with tachymeter scale. 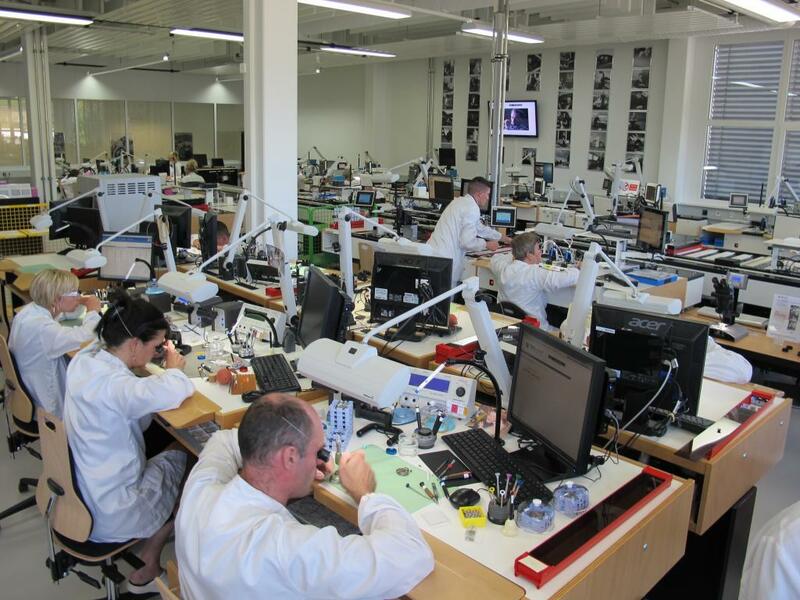 Watchmaking class at TAG Heuer headquarters. 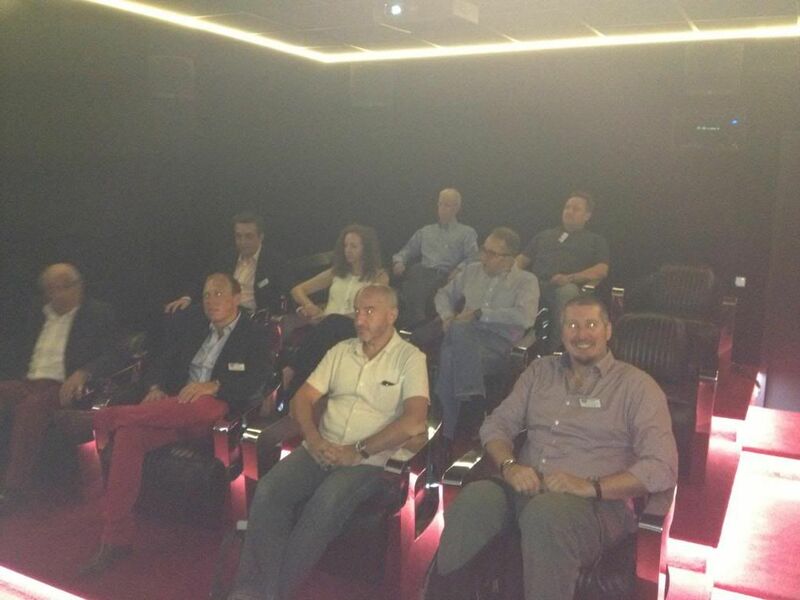 In the private cinema from TAG Heuer museum, commercial from “Rush” by TAG Heuer. 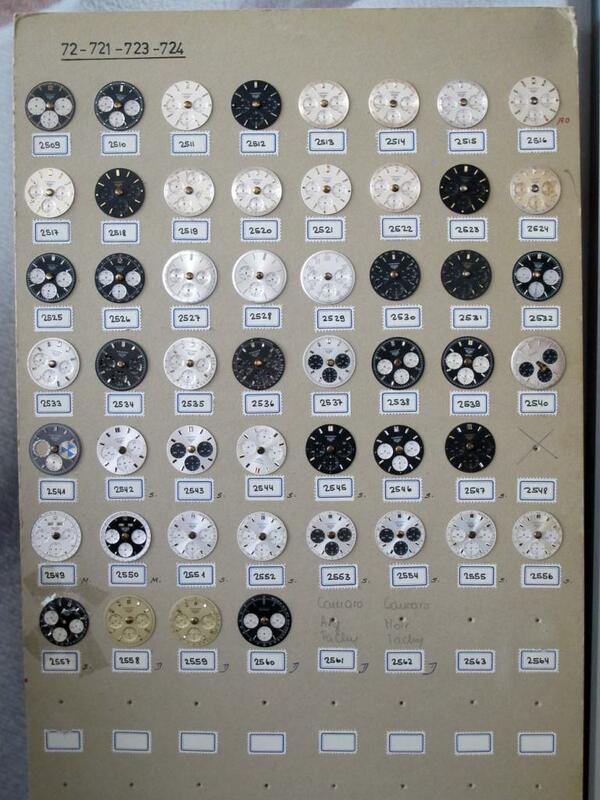 Unseen before…all dials officially produced for Heuer watches…all on cardboards with internal refs. Impressive and never exposed before. 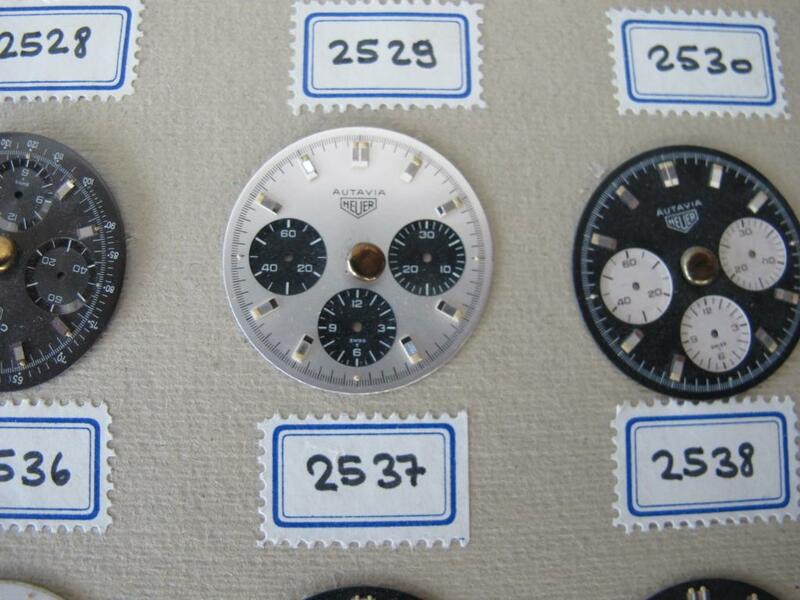 Some Valjoux 92 dials for Heuer. 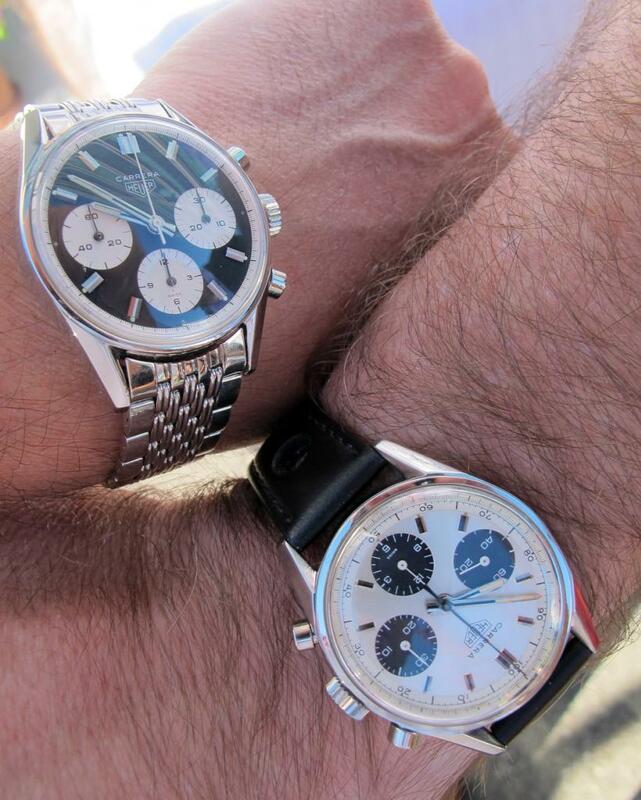 2446cSN Heuer Autavia…on the wrist! 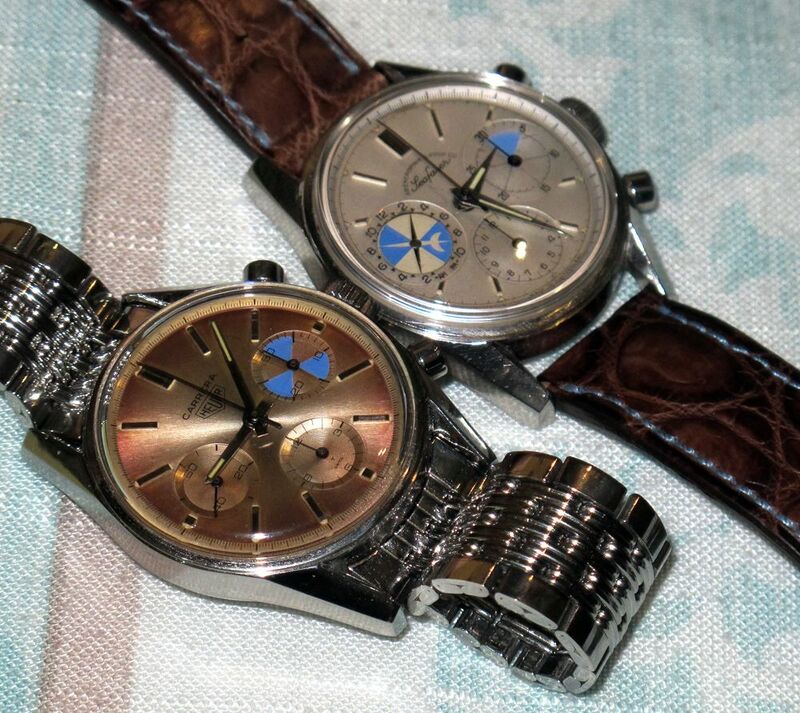 Two amazing Heuer Timepieces, the left one is Paul Gavin’s Yachting Carrera with unequalled patina and presence. On the right we have Paolo Bernardi’s Seafarer in first execution 2446 case. Again Paul Gavin’s 2447 Carrera Yachting, this time accompanied with Laurent Bouzoulouk’s Carrera Seafarer. Two of the same but different. 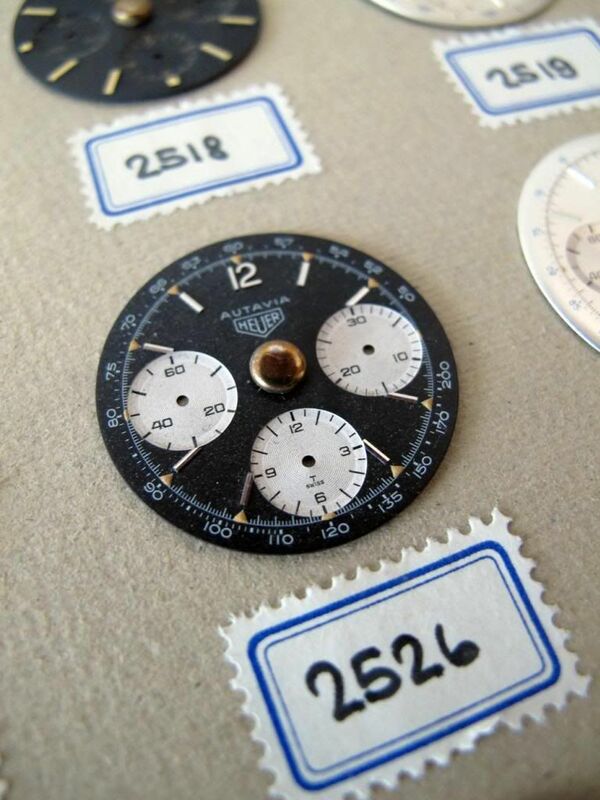 Heuer Autavia Ref.2446 2nd execution. From left to right; Rafael Gago De La Mata, Morgan King, Lanny Epperson and Jean-Pierre Magalhaes. 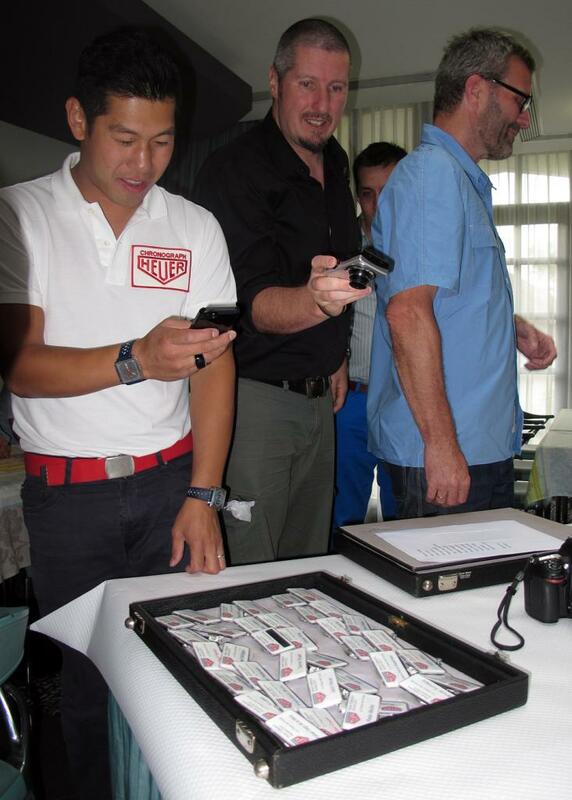 In the back we see the guy with the smartphone checking whether he won that ebay auction or not…Henrik Schreiber. Morgan King, Darren Stuart and Peter Moller. Jan Pedersen and Ron Henselmans. 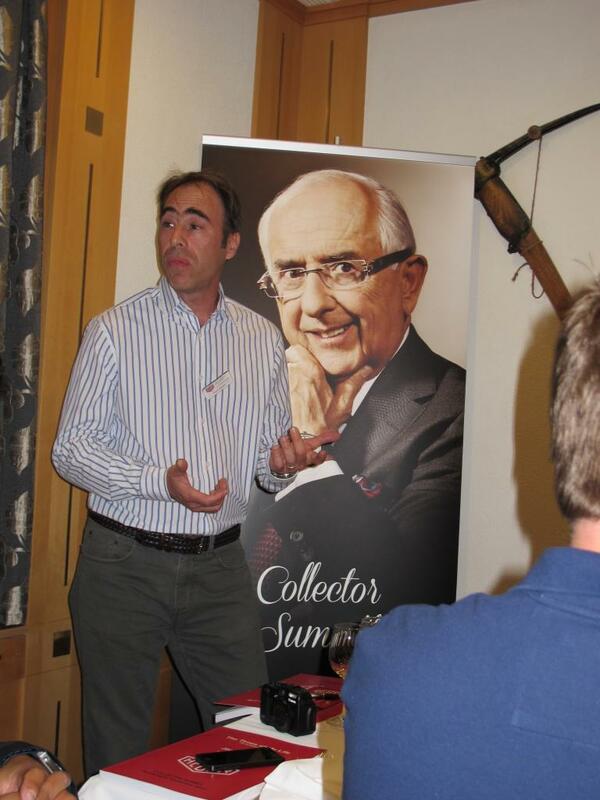 Peter Moller explaining his collection, Darren Stuart, Henrik Schreiber and Jean-Pierre Magalhaes. This…is not likely to happen soon again. Panda and inverse-Panda…or inverse-Panda and Panda…Mark Moss, please help us out! 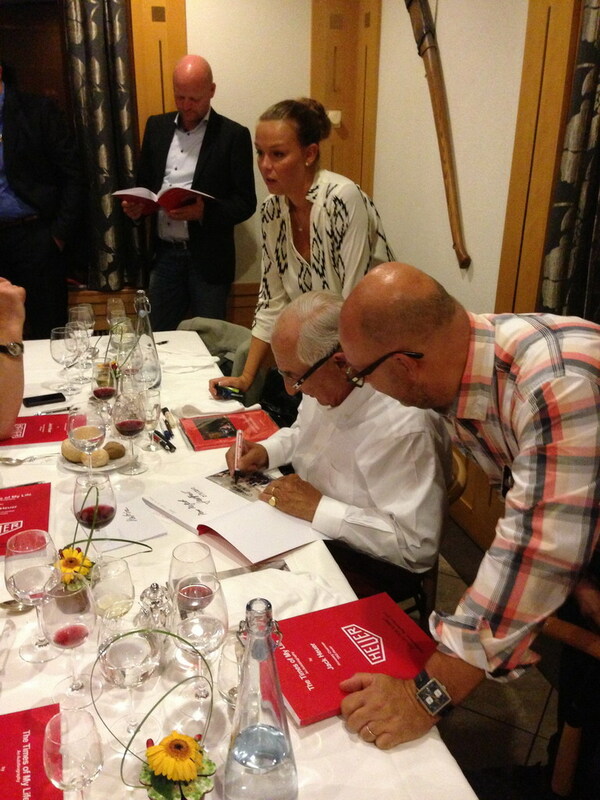 Paolo Bernardi having his book signed by Jack W.Heuer. 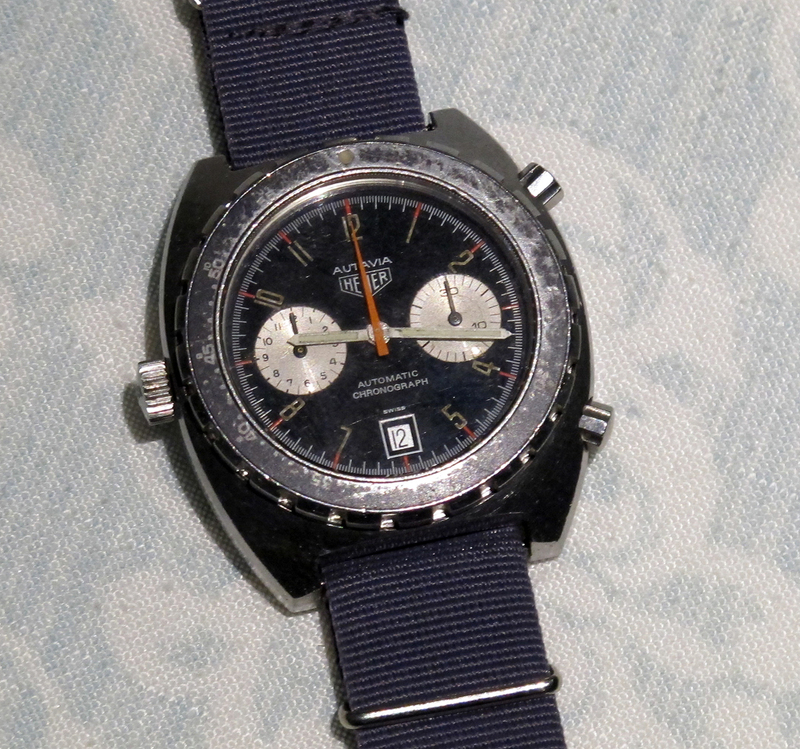 Heuer Carrera Ref.1158 – Club! 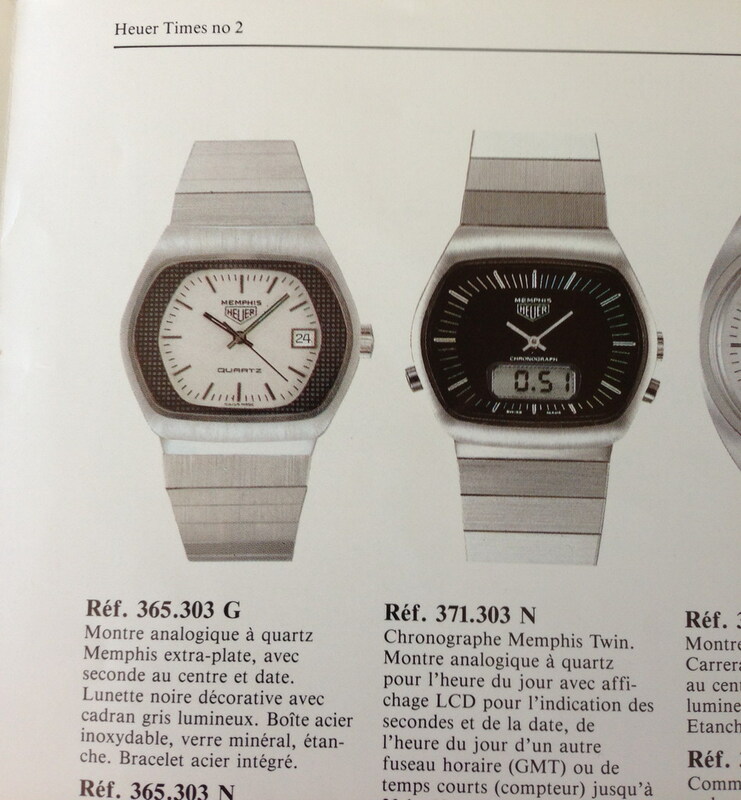 Apparently quite a “common” watch. 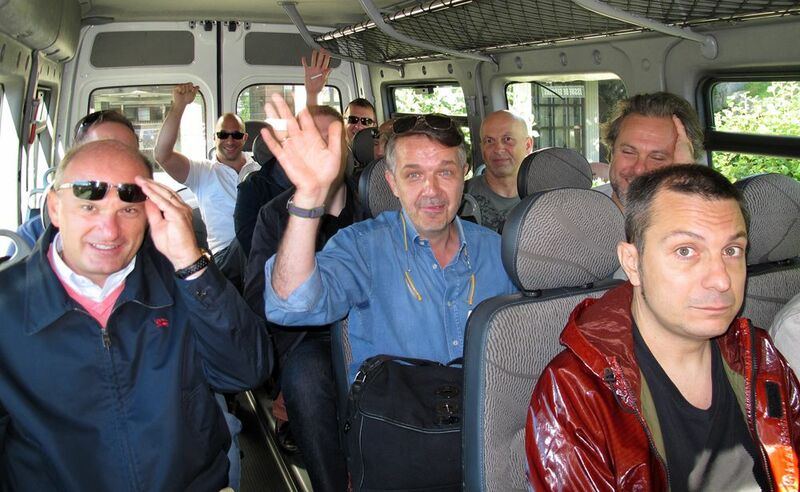 Top row; Michael Wirthgen, Mick Tock, Laurent, Bouzoulouk and Abel Court. Bottom row; Shaun Wainstein, Jasper Bitter and Paolo Bernardi. 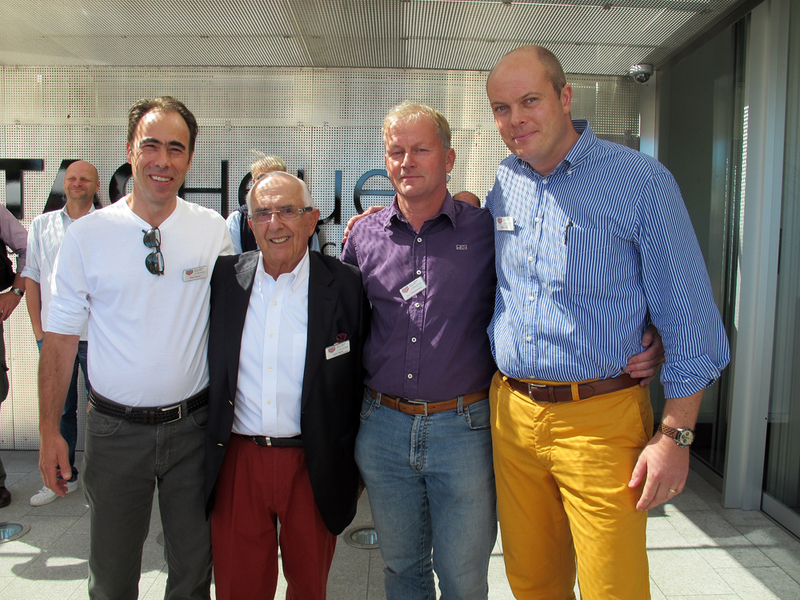 Our legend Jack W.Heuer together with the organizing trio — Paul Gavin, Ron Henselmans and Abel Court. So, obviously I had been looking forward to the summit for some time, but that excitement was mixed with a little trepidation as I was setting out. On two fronts in fact. 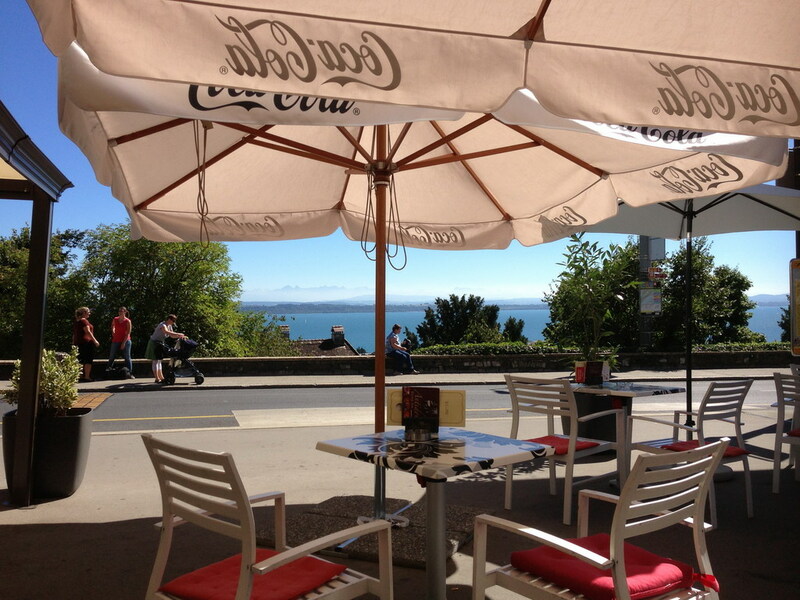 Firstly, my last trip to Switzerland was not exactly the easiest – it actually took me longer to reach Geneva from the south coast of the UK than it took Jeff from Georgia in the US! 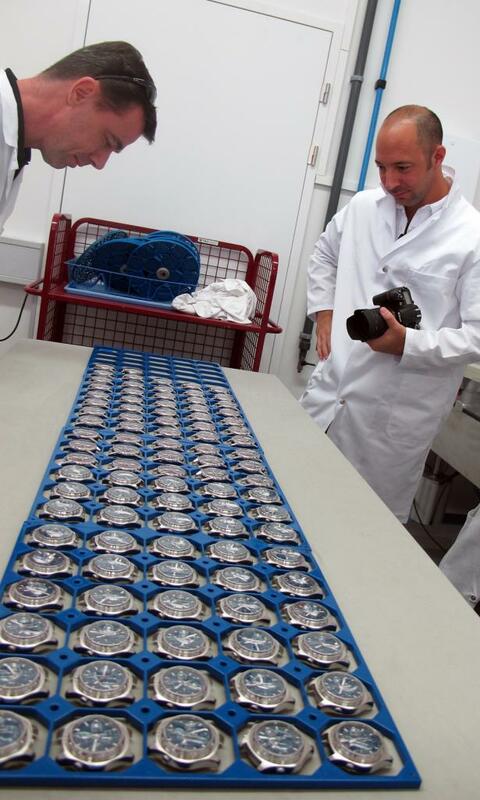 More than 16 hours… Secondly, the watches I had chosen were giving me pause for thought. Since I had heard Jack would make it, I opted for a digital element in what I would take. 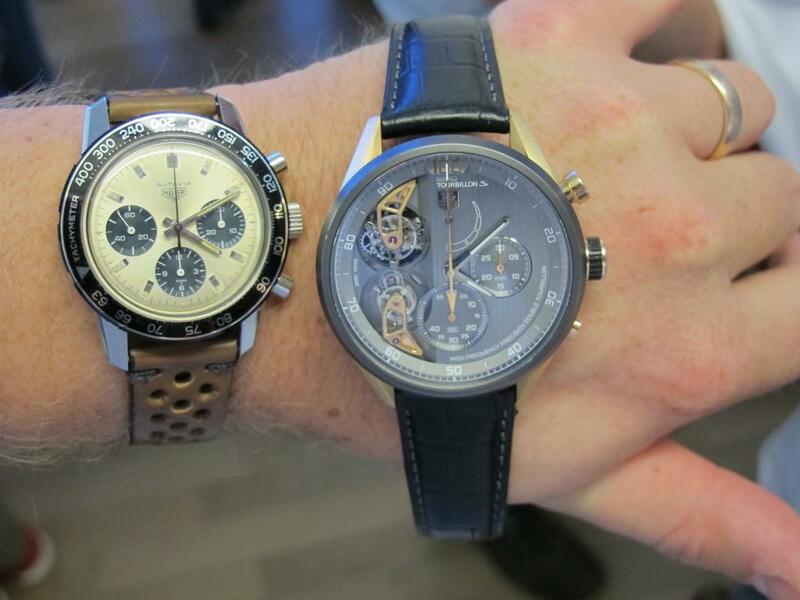 Specifically, the full set of Carrera Twins (black dial, silver dial, champagne dial/gold plate). The first concern didn’t come to pass, it was a perfectly pleasant trip. The second? Not so much. Now, each time you replace the battery in one of these ana-digis, you run the risk that it doesn’t come back as it did before. Mine always had, but treated to fresh batteries for the trip, they decided not to comply this time around. Stopping at Fleet services on the way to Heathrow, I noticed that the silver dial one I was wearing had stopped entirely (subsequently, I noticed it seems to run as long as it’s not on my wrist). So the black one got the call up. And I noticed on the flight that it was running about 15 minutes fast in the hour! Reaching the hotel, and bumping into Abel and Ron, improved the mood and I opted for the champagne model as the least recalcitrant (once I’d sussed out the deployant clasp it was on at least). Off to that evening’s reception then. Seemed I was one of the last there (I blame the deployant), so arrived to Fabienne giving a speech to welcome us to the event. It was a great evening catching up with those I’d met before, meeting those with whom I had only corresponded with by email and meeting those who were entirely new! 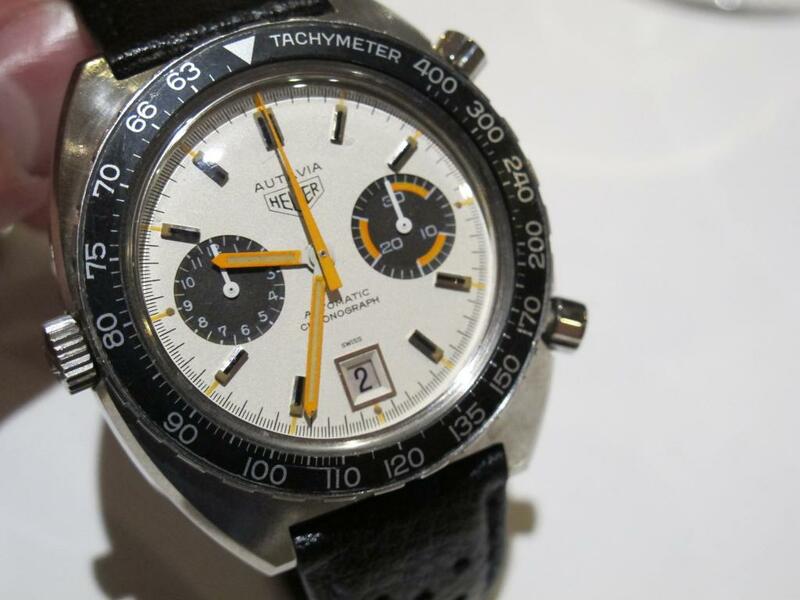 A few things stood out; the generosity of our favourite Belgian watchmaker (he knows why, thank you again), the overwhelming enthusiasm of Morgan King and (probably my stand out moment of that first evening) Peter having completed his Autavia movement collection with the last watch arriving on the night. A great theme Peter and an equally great collection. 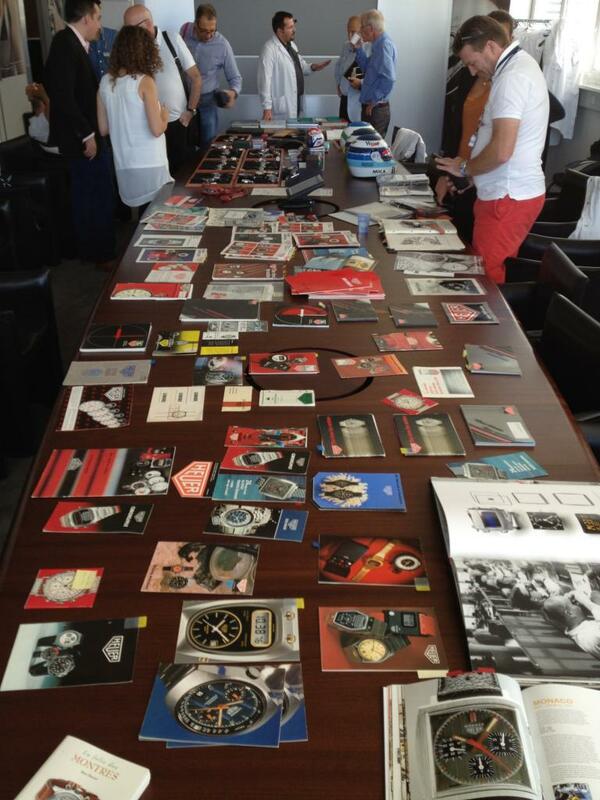 Lots of great watches and great chat, and something of a blur at this remove really! 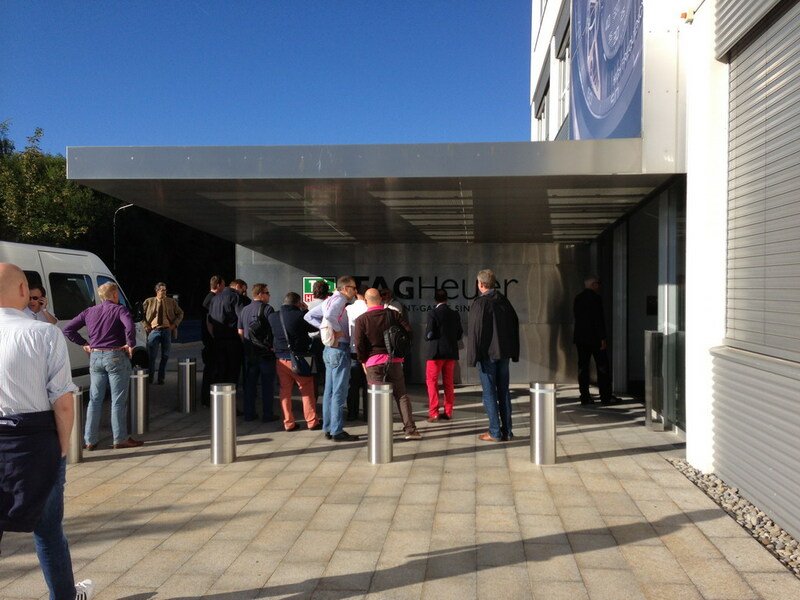 The next day sees us, to varying degrees of freshness, making our way into town to visit TAG Heuer itself. Received by our ever friendly and helpful hosts Marie and Alessia, we split into three groups as there were too many of us to do it all at once. 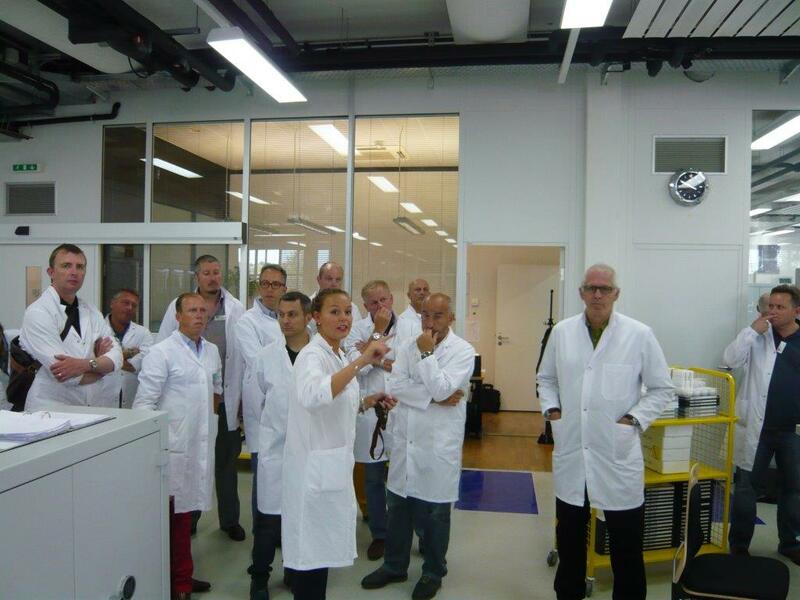 My group had the factory tour first, so after donning fetching white “lab coats” with TH branding, off we went. 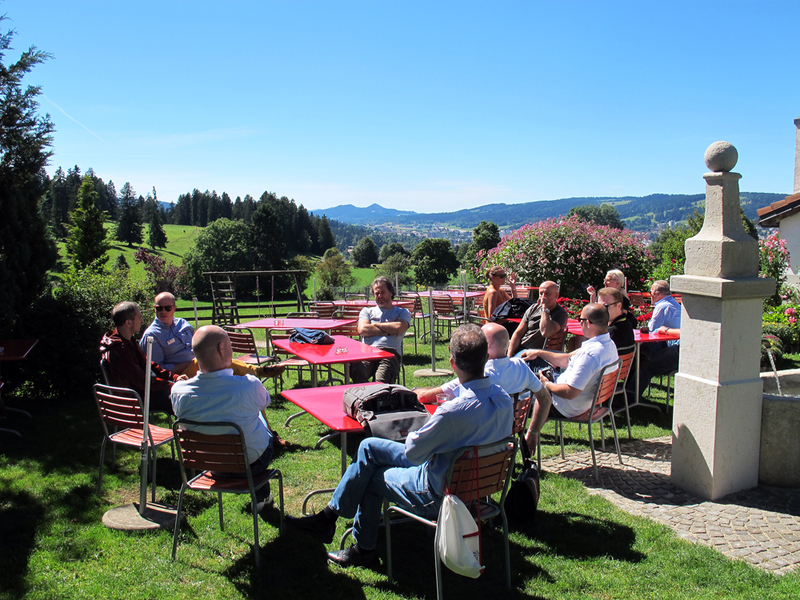 Thanks to Thomas Trefzer for the tour photos – not even my group, but I didn’t take photos myself during it. 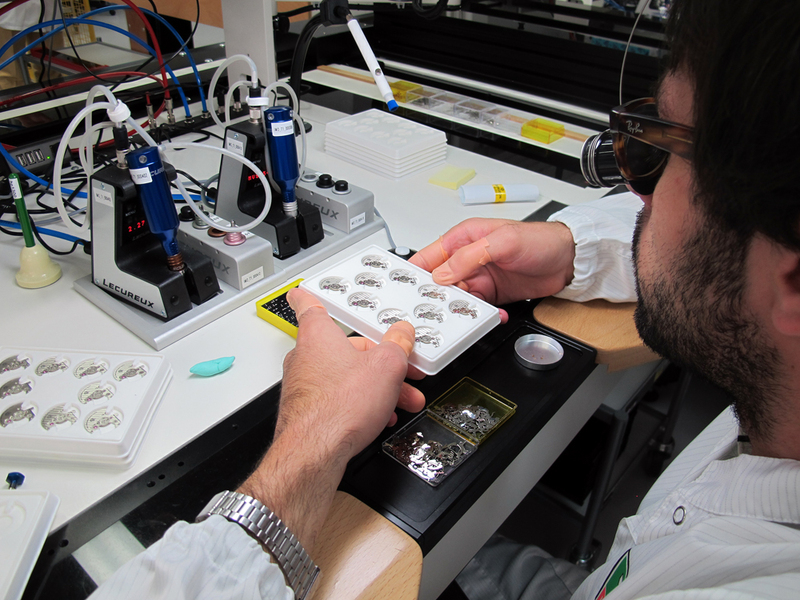 It was a very interesting tour, where the process is a mixture of the automated and steps still done by hand. To a mixed reception by the group, there are those who regret the amount of automation but I’ll confess to finding the processes intriguing. 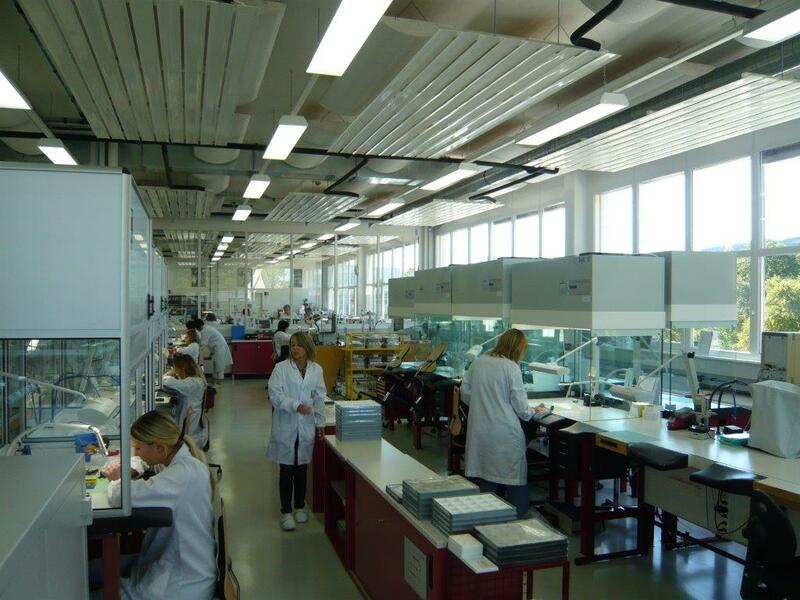 Movements are whisked between desks in a dust-free conveyor system, oil is applied in microscopically correct volume, screwdrivers preset to 0.39 Newton centimetres. 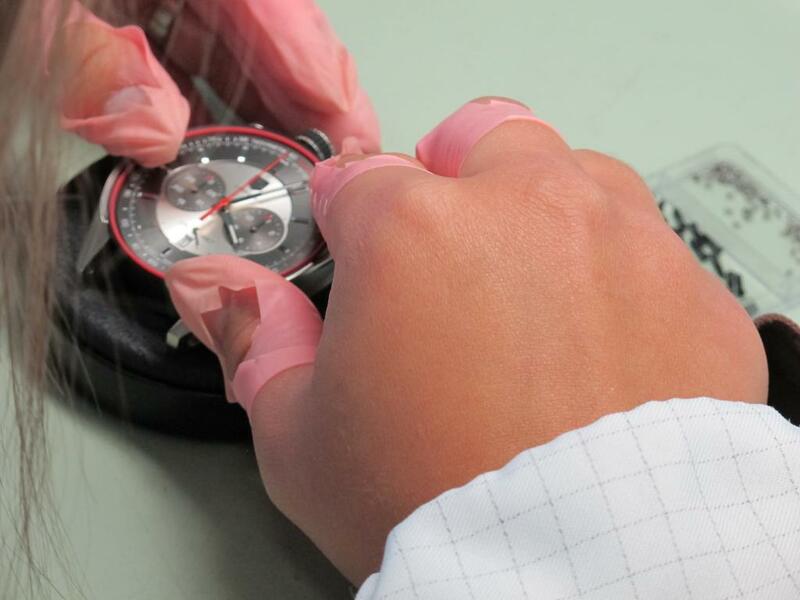 And yet later on, hands seen through magnification are eased into place by hand. 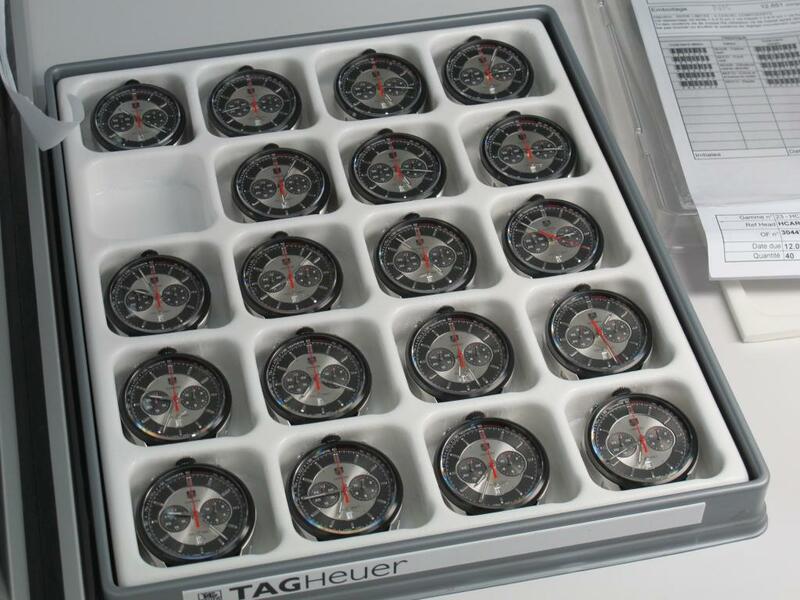 Tray after tray of 1887 movements, Jack Heuer limited editions. The scale is impressive, the machinery modern. 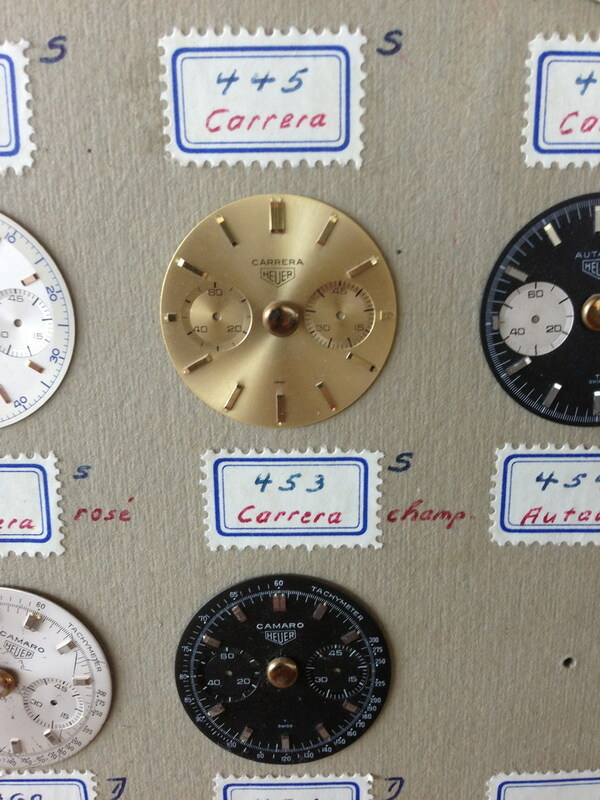 Part of the tour was in a laboratory, where components are tested for the various forces that careless users apply to them – clasps opened many times a minute, movements “dropped”, dials subjected to intense UV (very interesting when looking at Paul’s beautifully patinated “rose” Carrera). 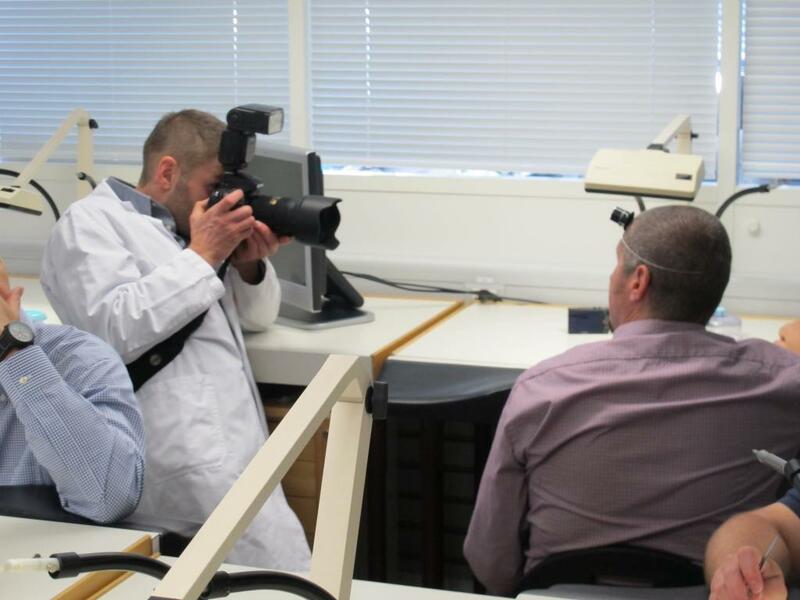 But even more interesting was the ultra-high speed camera rig set up to show just what happens when we press the reset pusher on our chronographs. It resets neatly to 0 right? Not at all! It swings right past 0 to about quarter-to, then to about 10 past and back and forth a bit more before finding 0. 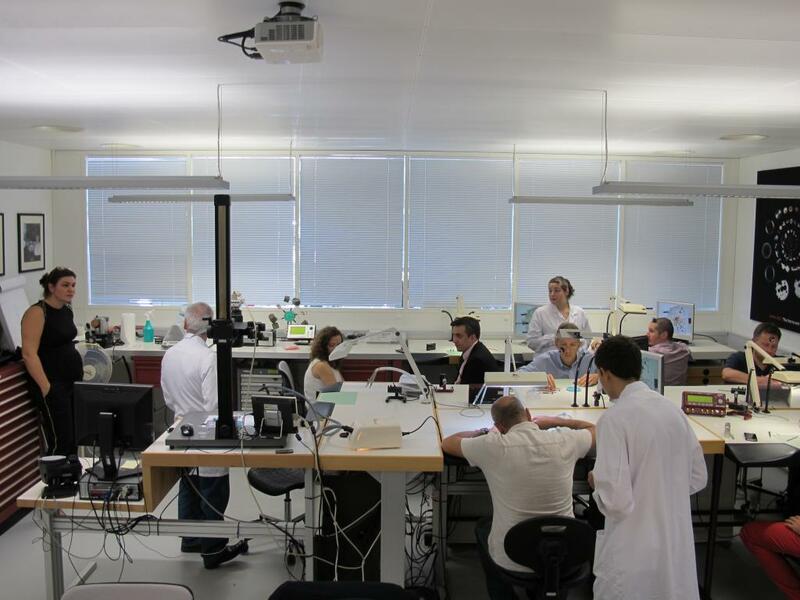 We also took in the haute horologerie room, with a handful of watchmakers putting together the cutting-edge watches Heuer have been putting out for the last few years. 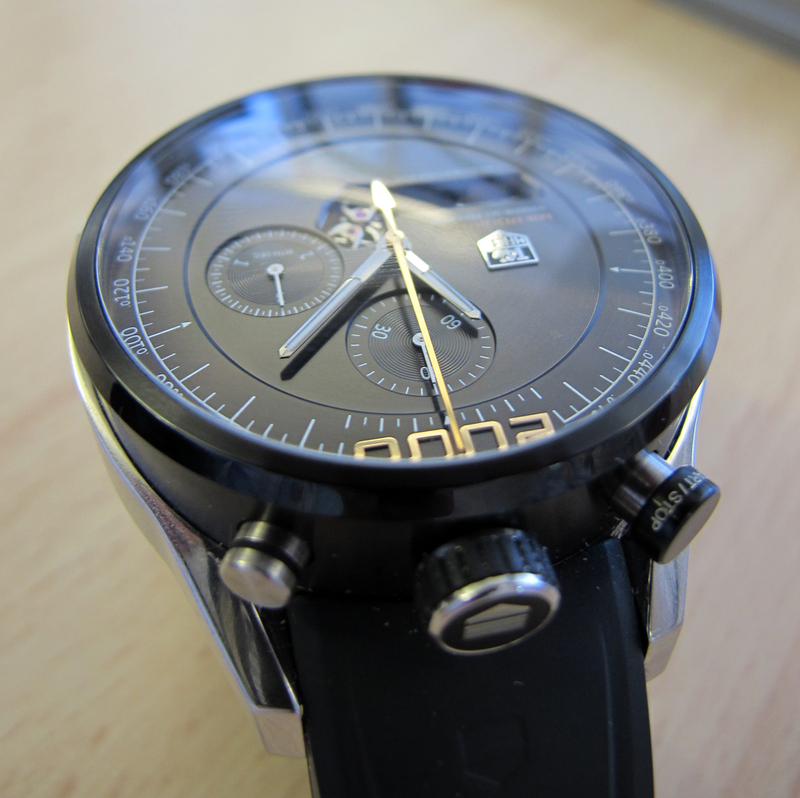 Monaco V4s, Mikrogirders, Mikrotourbillons – there’s a few quids worth of watches right there! 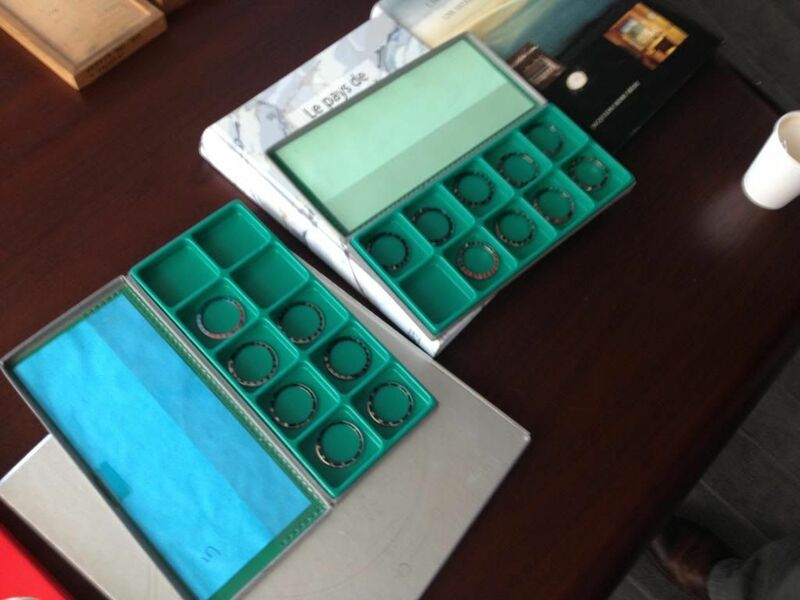 Not that the staff were at all precious about them – watches were freely handed around, worn, photographed… And I’m fairly sure the same number went back into the case as they started with! 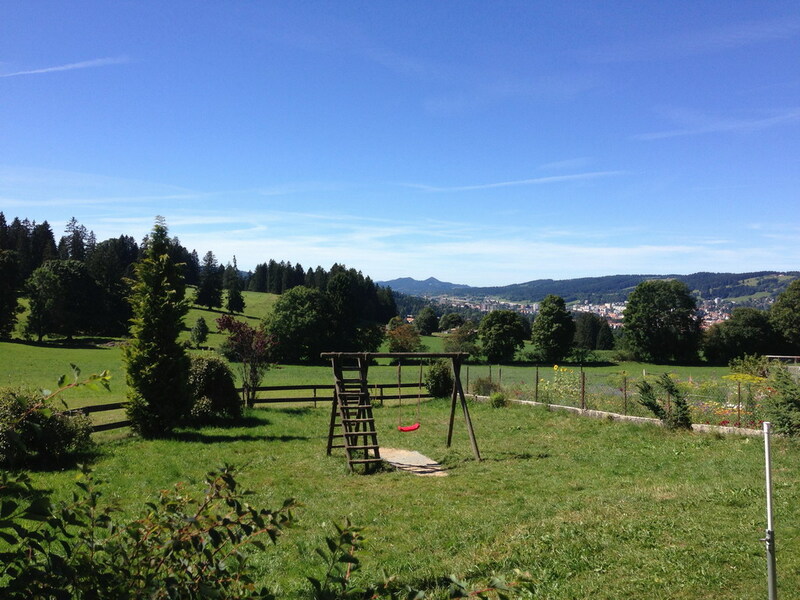 And then time for lunch up in the Swiss Jura. Lunch? Traditional fondue of course. 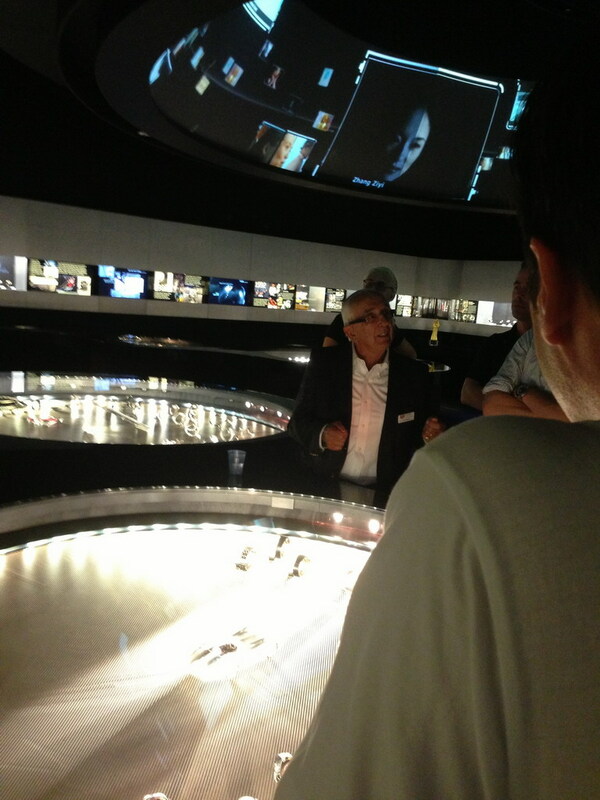 Back to TAG Heuer and a guided tour of the museum. Our tour guide, you may ask? 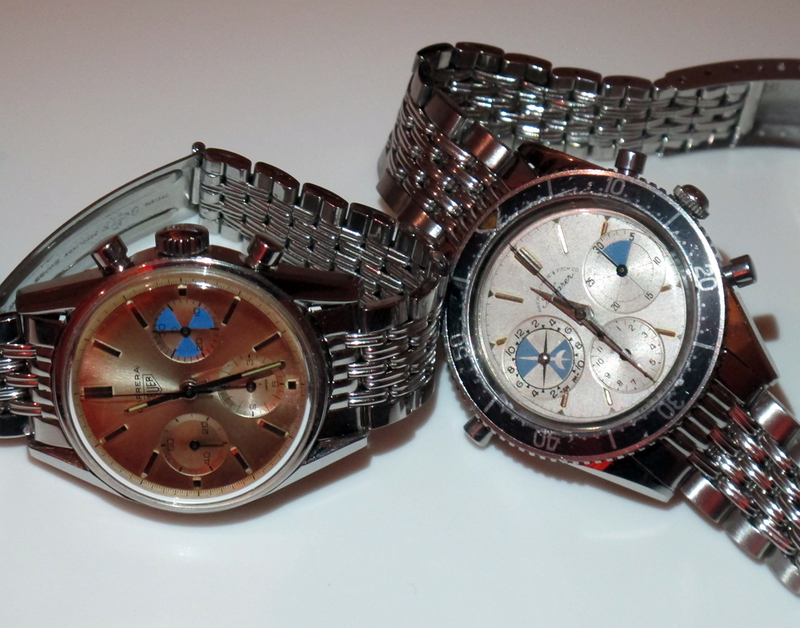 A certain Jack Heuer. Very interesting to hear Jack’s insights into the various exhibits, and particularly for those wearing digital Heuers when he chose to dwell on those developments. 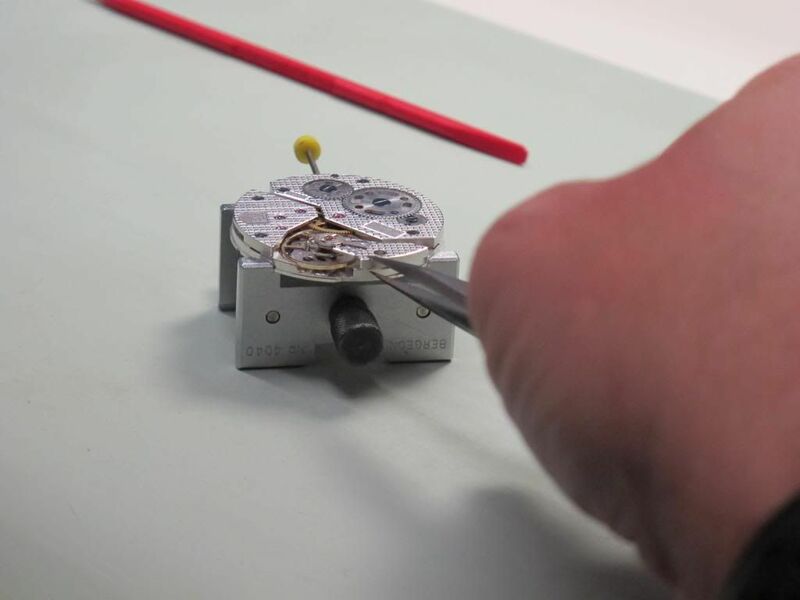 A lesson in dis- and reassembling a watch movement was very interesting too. Thanks to Jasper for the photo and especial thanks for not sending one where I was using my tongue to help concentration! 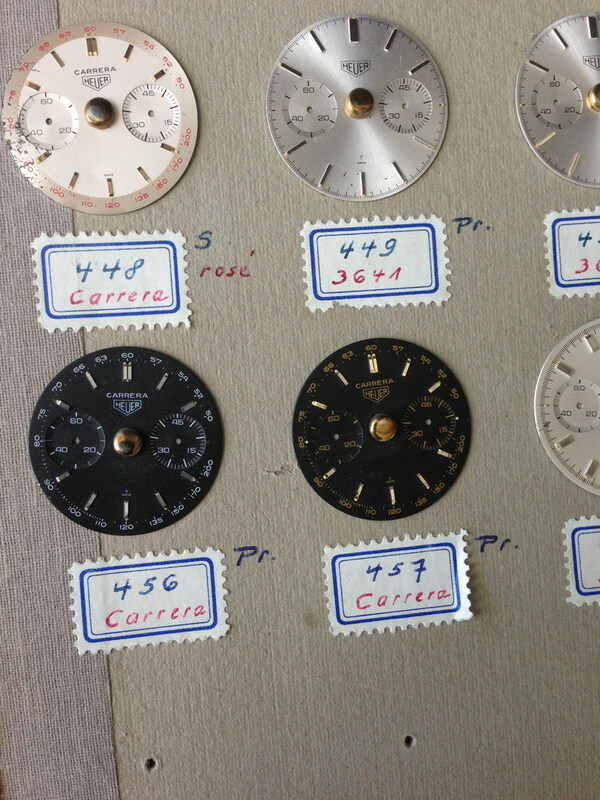 But of all of that, for me the most interesting was a series of cards into which dials had been fixed, covering just about every dial on offer from the mid-50s to 60s. And then on to the evening meal, hosted again by Jack himself. Much more chat, watches (a group shot of 1158s made me wish I had taken one along), a lapel badge (thank you Mick) and Jack giving up more of his time to autograph all and sundry. My question was how the design process works today. 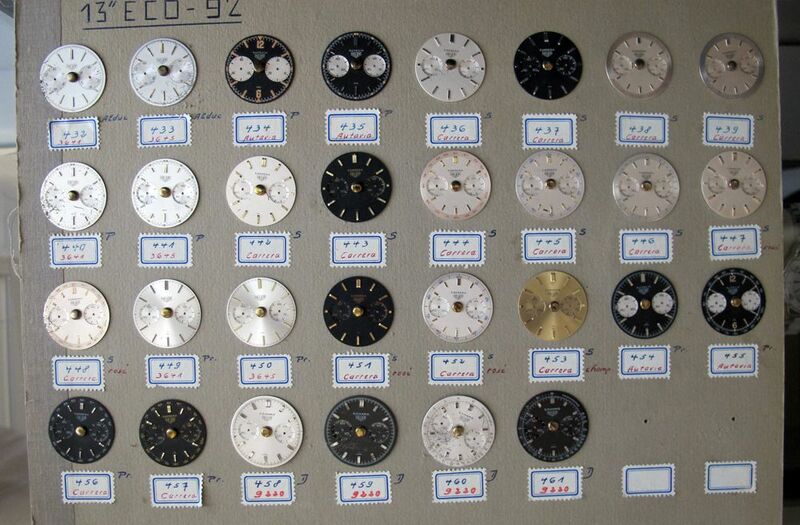 Historically the dial producer would have taken samples to the watch company, who would have asked to follow up on the design. 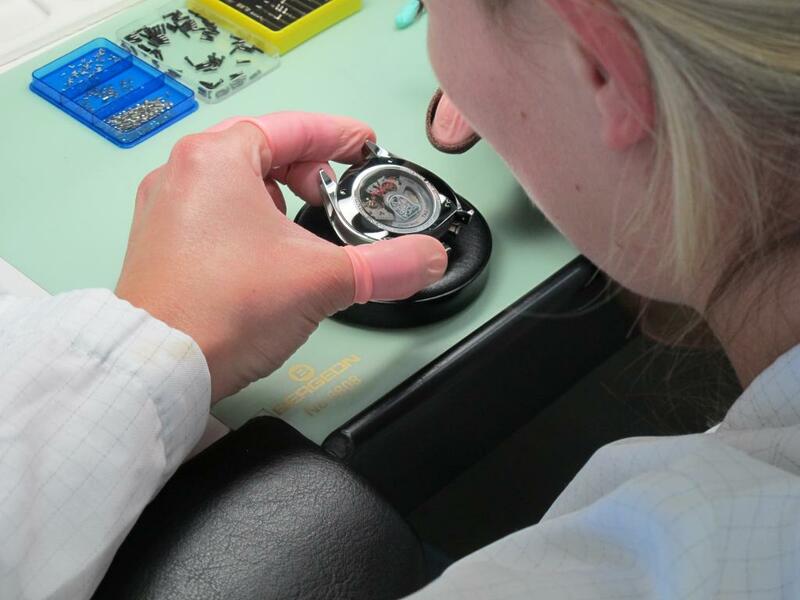 Today, the design work typically goes on “in house” at the watch co and companies like Artecad put those designs into production. 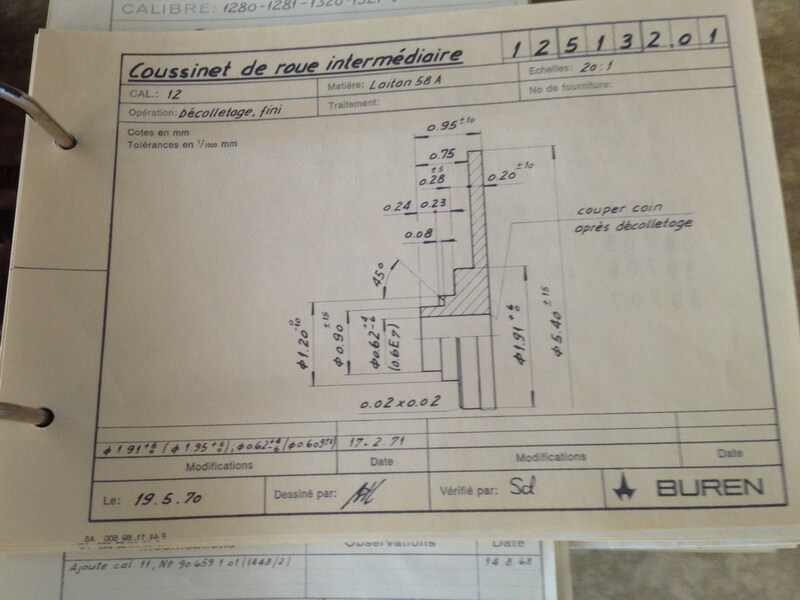 Now, that production process was very interesting for me too. 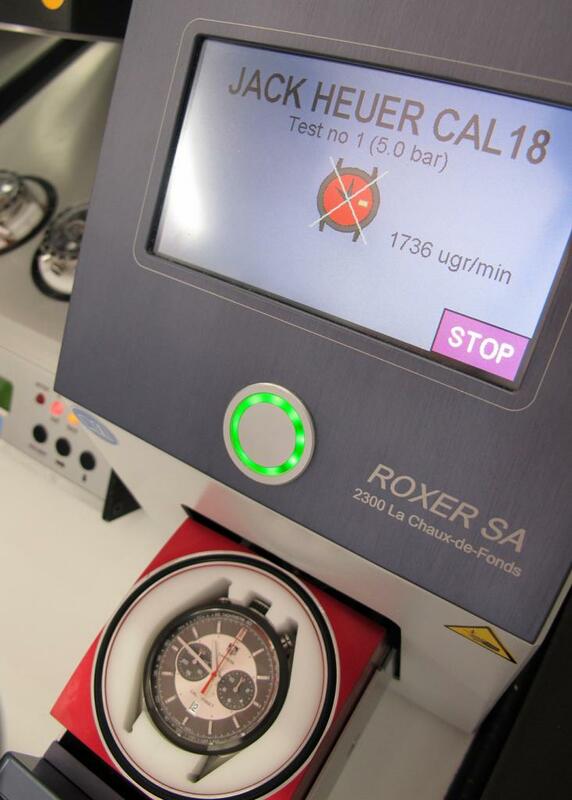 The dial is effectively the “face” of a watch and the thing we look at most often, so an insight into the “hundreds of processes” (in response to a question from Darren) was rewarding. In contrast to the modern facilities at TAG Heuer, some of the presses at Artecad were considerably older (and each one had a name!) but still do the job, with the floor around evidencing the force with which those things operate. Lots to take in, but highlights include Jasper getting a lesson in anticipating who might be multi-lingual ( 😉 ) and the black light cabinet used to test lume. I’m given to understand the other group was more restrained but the black light was a cue for my group to thrust hands and wrists under the light to check the lume on our own watches! And who should be on the train but Mr Crosthwaite, who had left the group the evening before. 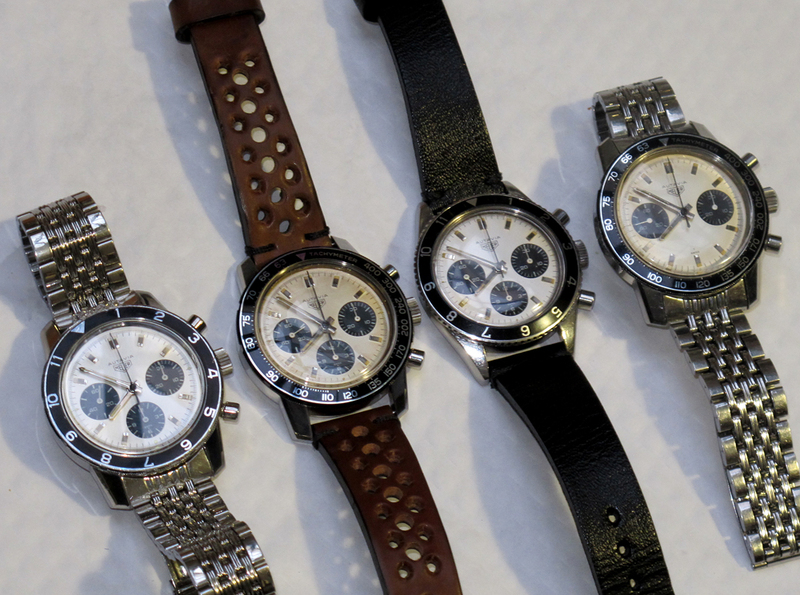 It’s a small (Heuer) world. Too quickly, it was all over, but hopefully this gives a reminder for those who attended and some insight for those who couldn’t make it. Finally, thanks to Jack Heuer; our friends at TAG Heuer Marie, Alessia and Fabienne and all the others who found time in their busy days for us; our organisers Abel, Paul and Ron; Peter for ferrying me around so much (and Jan and Darren for not being able to speak Danish with me in the car) and everyone I spoke with at the event. If we didn’t talk, there’s always next time!